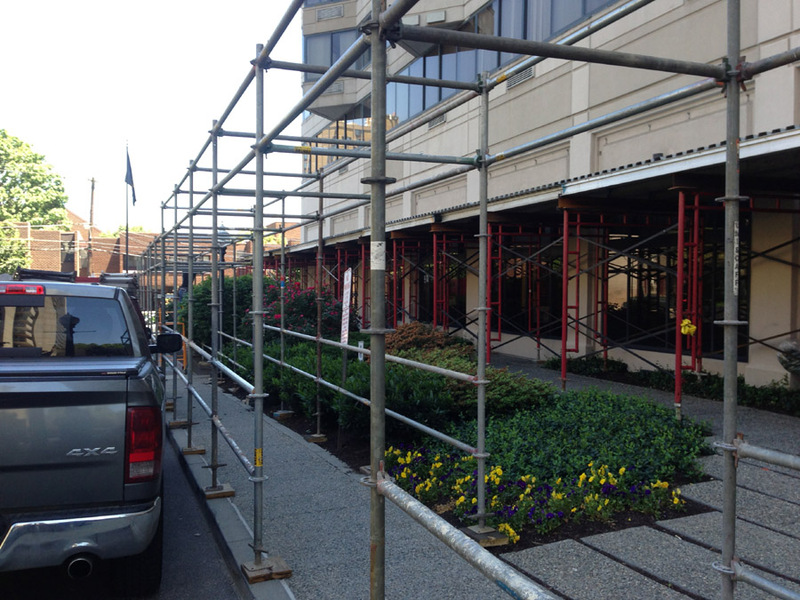 Superior Scaffold Sidewalk Shed: The key to commerce. To some this might seem a bit commonplace, since you see them everywhere, but to us it’s the key to commerce. 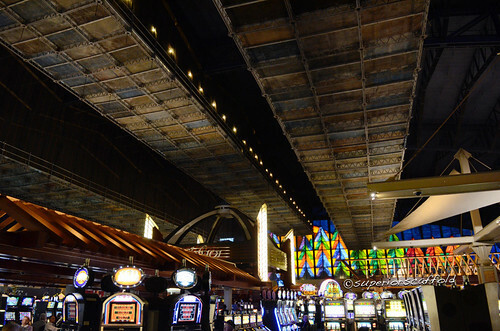 These canopies are what keep industry rolling. Just think about it for a minute. 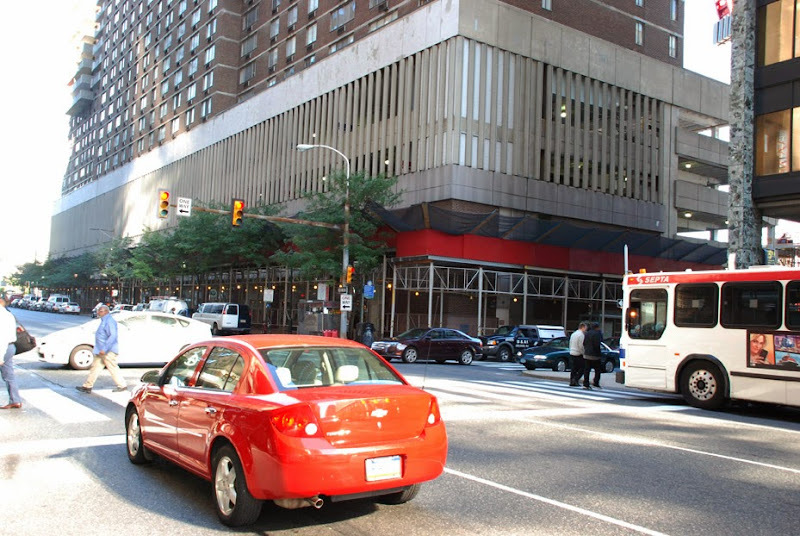 If we didn’t construct these sidewalk sheds around buildings that were doing façade work or window replacement or brick and mortar repointing, everything would shut down. No food for the tenants, no around the corner morning coffees, no treats or ice cream – nothing. These are our very own little stimulus package. Many times, just like with this canopy, it serves a dual purpose; one, keeping the building and byways open for business while protecting the patrons and two; it also works as a platform for our swing stages. (We will have some additional pics later). 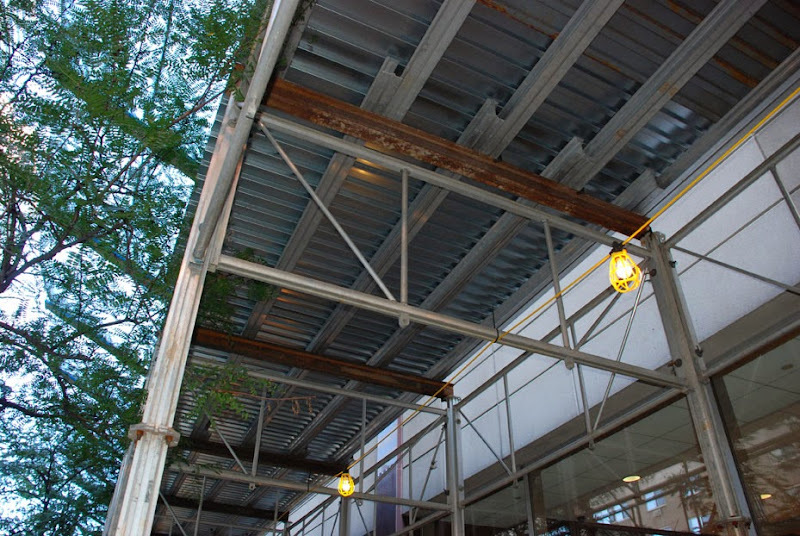 These are known by a couple of names – Canopy, sidewalk shed, overhead protection. It really doesn’t matter which one you use or prefer but the result is the same. I never really understood the term “Sidewalk Shed”. Maybe it’s because it’s shaped like a shed and provides protection overhead and from the sides? It’s sits on the sidewalk, that part makes sense but it’s really not a shed, it’s more of a walkway, a passage, a throughput… Hmm???? 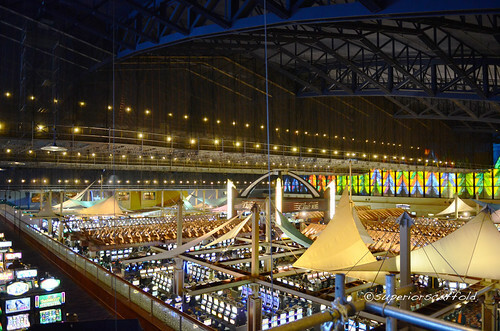 I looked up the term Shed in the dictionary and this is what it said: a slight structure built for shelter or storage; especially : a single-storied building with one or more sides unenclosed. Someone in the office suggested that the term might have come from train shed, or snow shed. 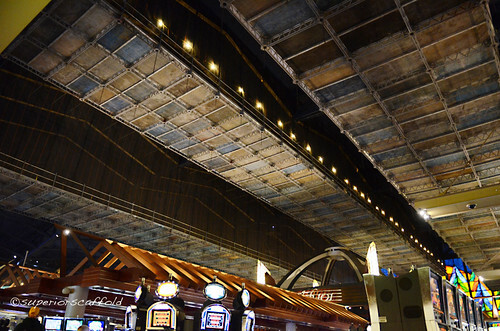 He mentioned that it might be anything with sides and a roof and then said that it could have come from NYC – back when they used to use corrugated metal on the sides so they looked like a shed. I don’t know. 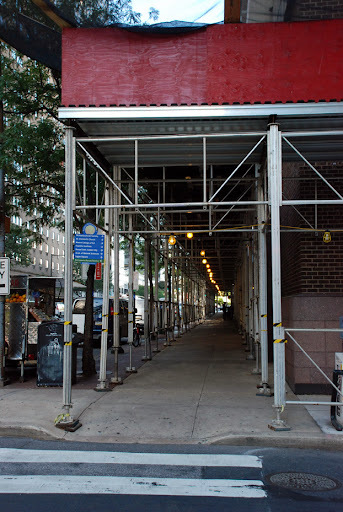 Googling around really didn’t produce much – other than: A sidewalk shed must be erected whenever materials will be hoisted over the sidewalk, regardless of building height or horizontal distance between building and sidewalk. 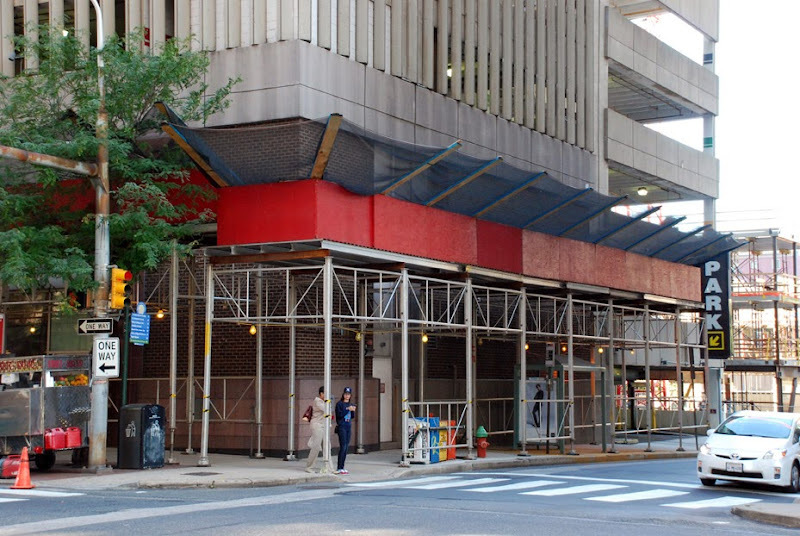 This is a very well designed and constructed canopy at the corner of 20th and JFK, in Center City, Philly. 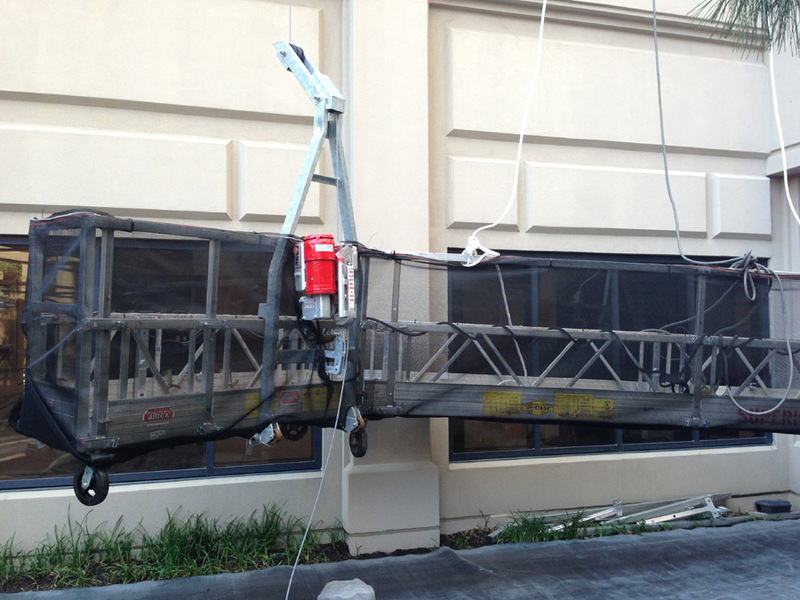 It’s what we call an extra-tall canopy to clear the giant storefront windows. 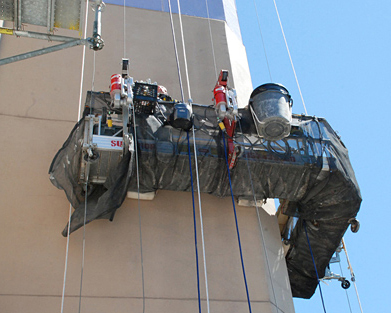 Superior Scaffold can accommodate any scenario – large, small, medium, wide, short, we customize them to every job. 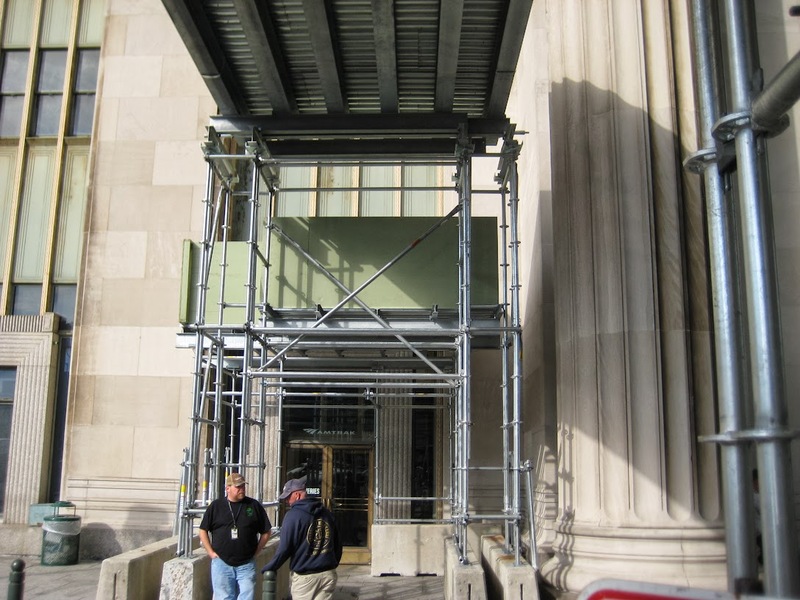 We can add different colors that accent the building (see our Amtrak canopy blog) put debris netting around the top for added protection, and even completely enclose the sides to protect against the elements. 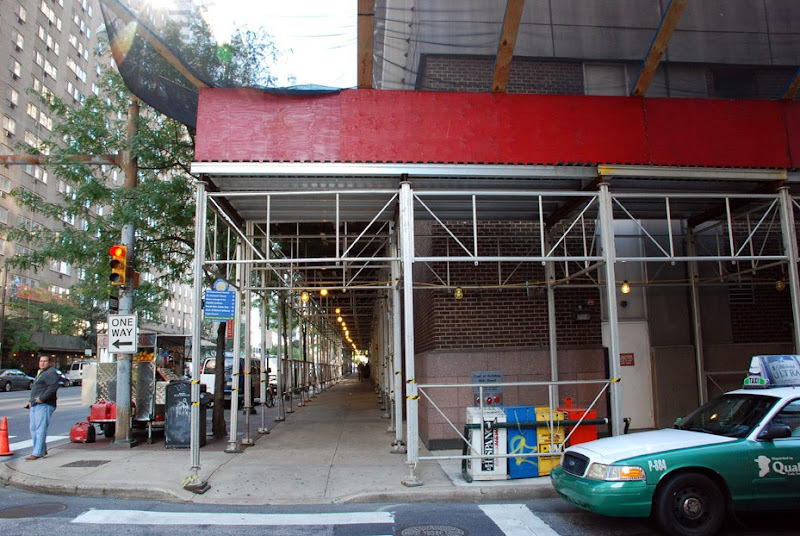 So, the next time you are walking through Philadelphia or any city, for that matter, take a moment to thank your scaffolding company (Superior Scaffold on the East Coast) for their work helping to keep your city moving and open for business. 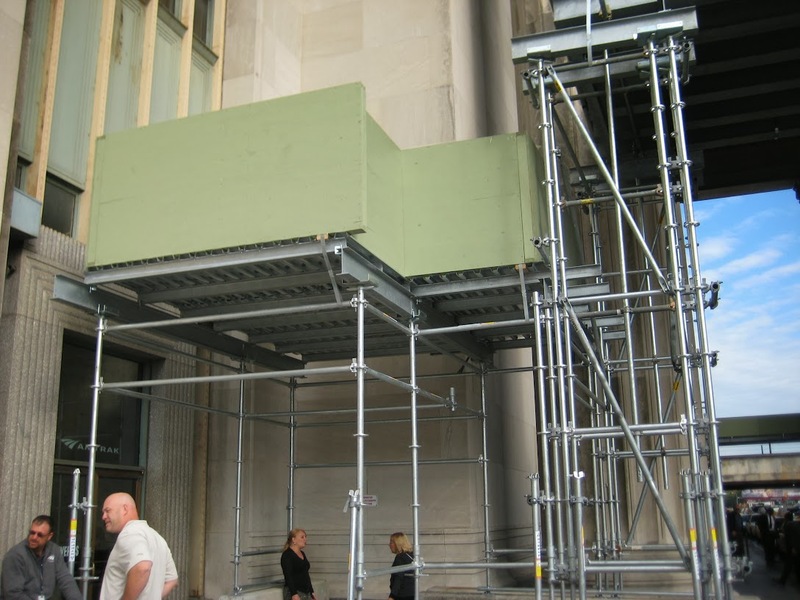 And if you find yourself in need of a Canopy, Sidewalk Shed, Overhead Protection, or sidewalk bridge – pick up the phone and call Superior Scaffold today at (215) 743-2200 or visite www.superiorscaffold.com. This is a monstor of a job. 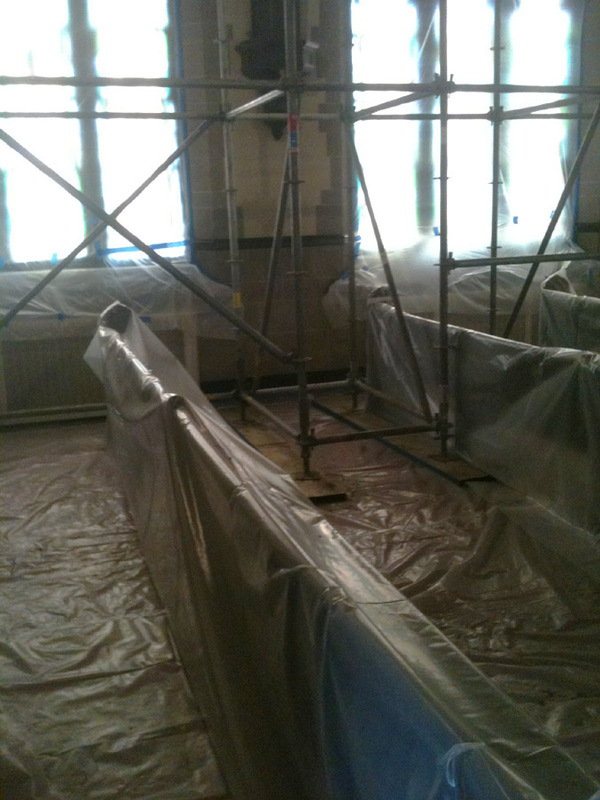 We promised some photos and since we, at Superior Scaffold, keep our promises – here they are. 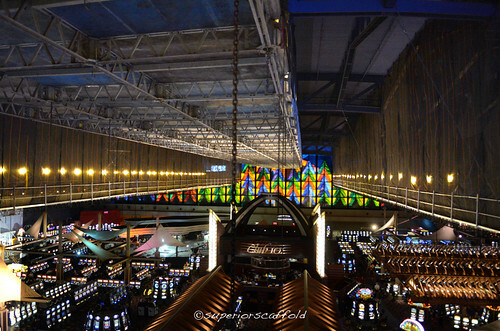 It’s hard to believe that this all hangs 40 feet ABOVE the entire gaming room floor while people are hustling and bustling about underneath. 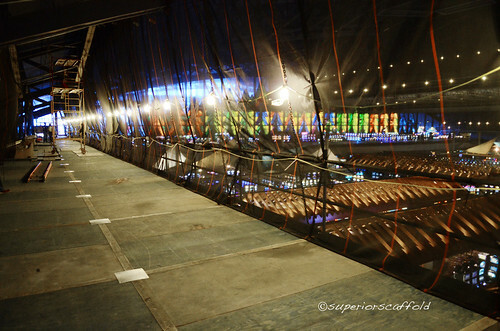 They sit above the interior that is the size of 2 full length football fields. These wings or fingers are 300 and 400 feet long! 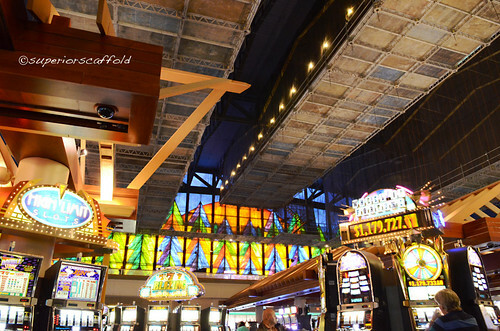 What this project entails is getting crews up underneath the ceiling while the casino remains open for business as usual so they can get the new HVAC and mechanicals installed. 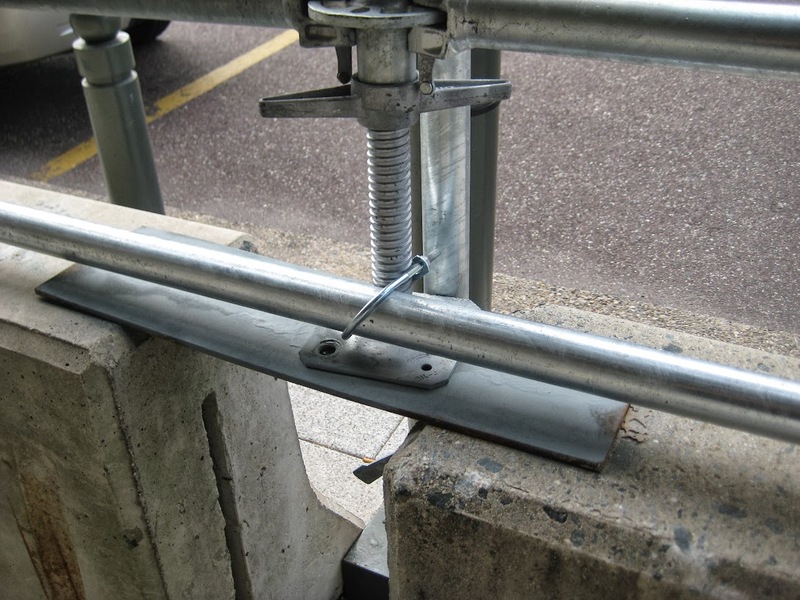 The solution came in the form of what is called a multi-point suspended scaffold. 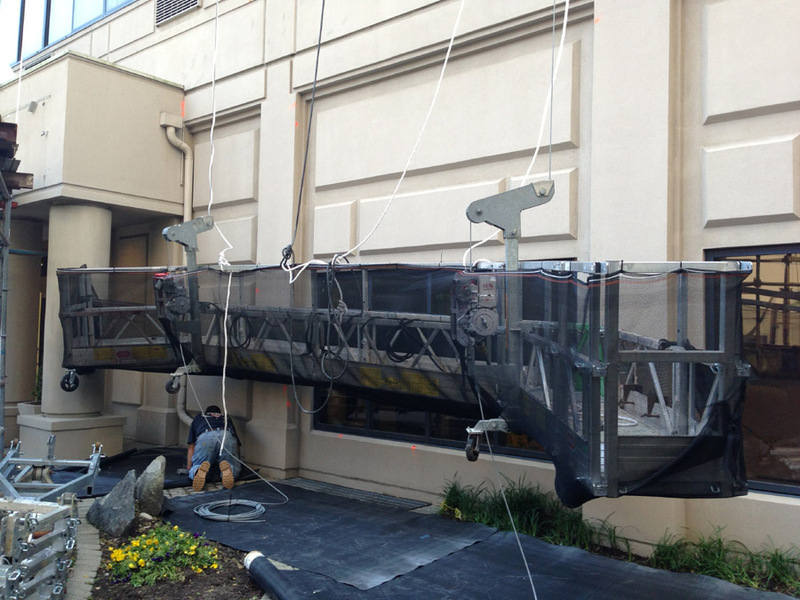 It’s not only wide, but stable enough to hold equipment, rolling towers, HVAC piping, etc. 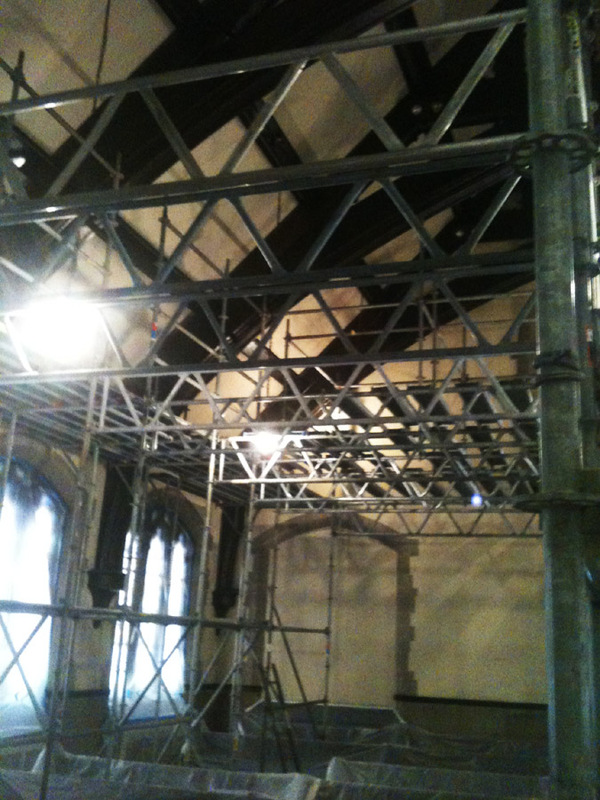 These giant work platforms actually hang from chains from the arched trusses at the ceiling. It’s netted in so nothing can fall off of the sides and its sturdy enough to support just about anything you can put onto it. We’ve done these before (see blog on Hanging bridge platform) but never at this scale. 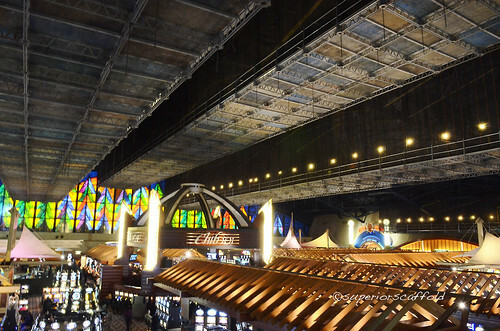 The ceiling has giant arches which of course curve and give different elevations along that curve. 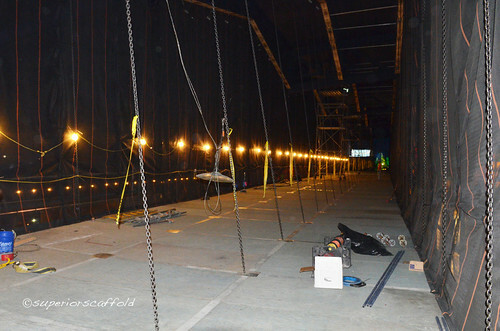 So the challenge for our crews was to get the lengths of chains correct over the entire spans of this platform while they were assembling them to keep the platform perfectly level. 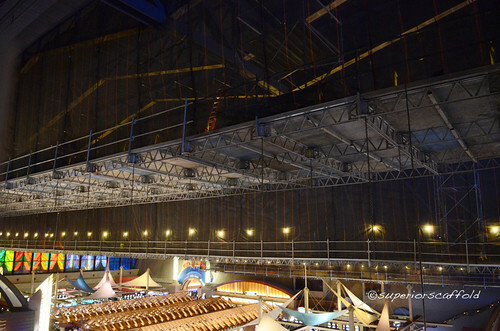 The segments had to hang at different elevations from the trusses to accommodate the particular ducting and venting going on up there. 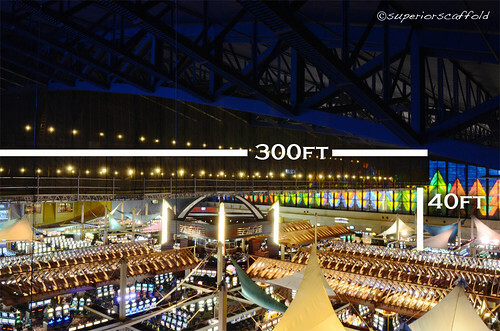 Some lengths would be 20 feet while others would be 10 and so forth. 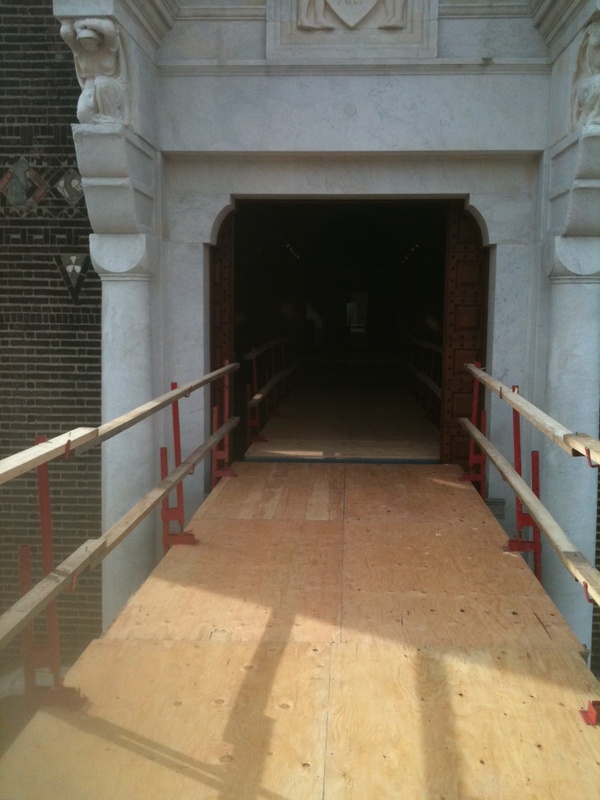 But once our guys go the proper lengths in place the platform was installed, level and sturdy. Here is a video so you can see in real time what these platforms look like. There aren’t many comapanies that can or will undertake an immense job like this. 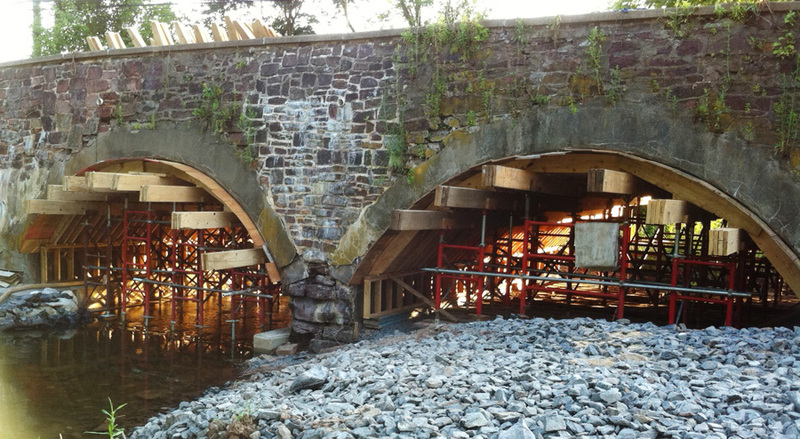 Our star estimator, Anthony Pini, made it his personal mission to come up with solutions to solve this engineering problem – and his team succeeded without incident. 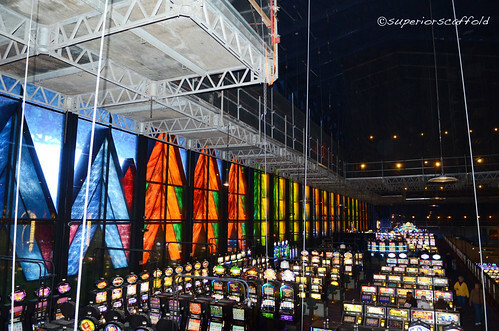 The new HVAC and mechanicals are installed and everyone at the Seneca Niagara Casini can literally breathe easier! 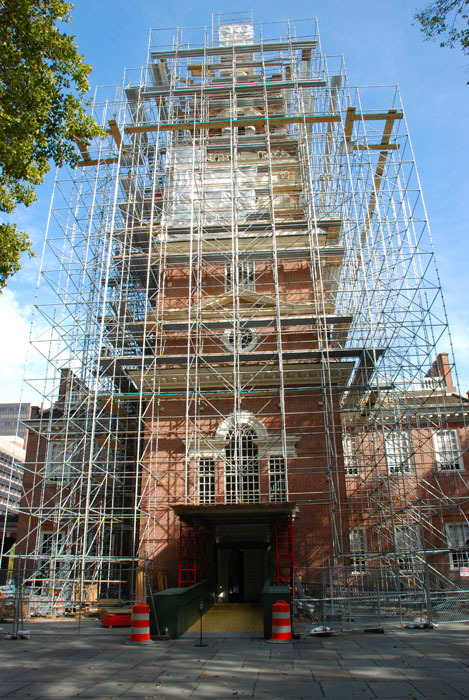 Call Superior Scaffold today at (215) 743-2200 for solutions to your unique scaffolding project. Ask for Tom Cruise, AKA Tony Pini. 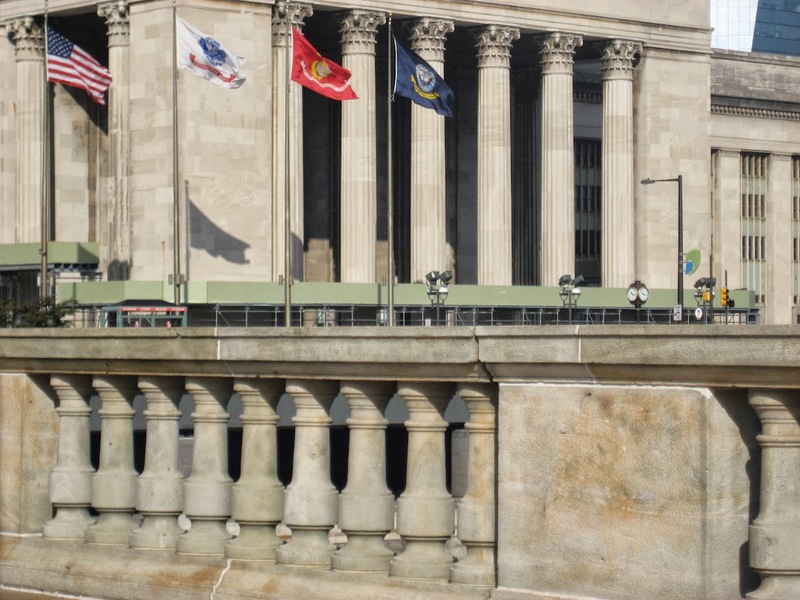 Amtrak wants to make the neoclassical 30th Street Station a more welcoming gateway to West Philadelphia and Center City. 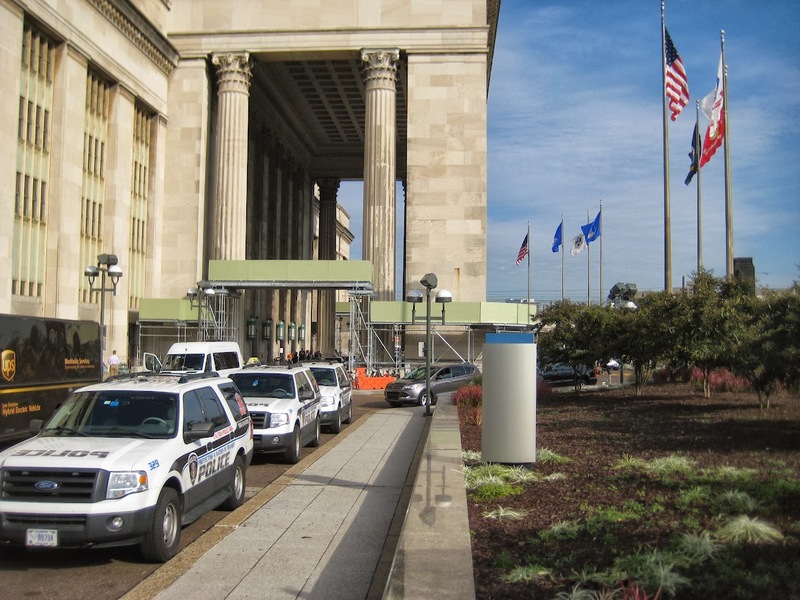 The 30th Street Station handles 120 Amtrak trains, 960 SEPTA trains, and 26 NJ Transit trains each weekday. More than four million Amtrak passengers went through the station last year. 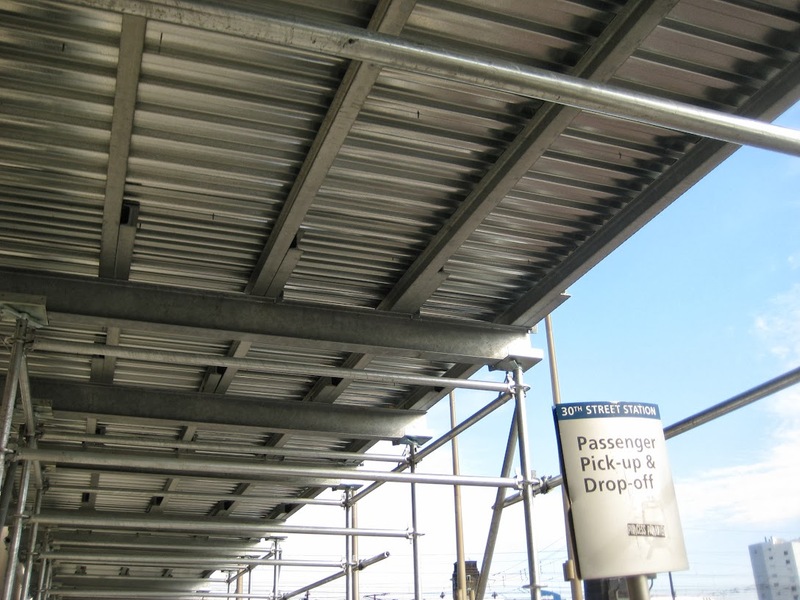 Superior’s first order of business was to erect canopies and sidewalk protection around the entire building – and that’s a good sized building. 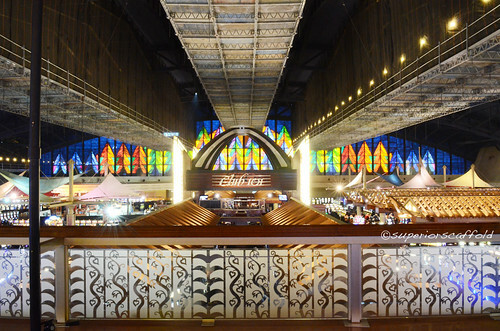 The station is a hustling, bustling metropolis all of its own with cars, buses, and lots of people all the time. 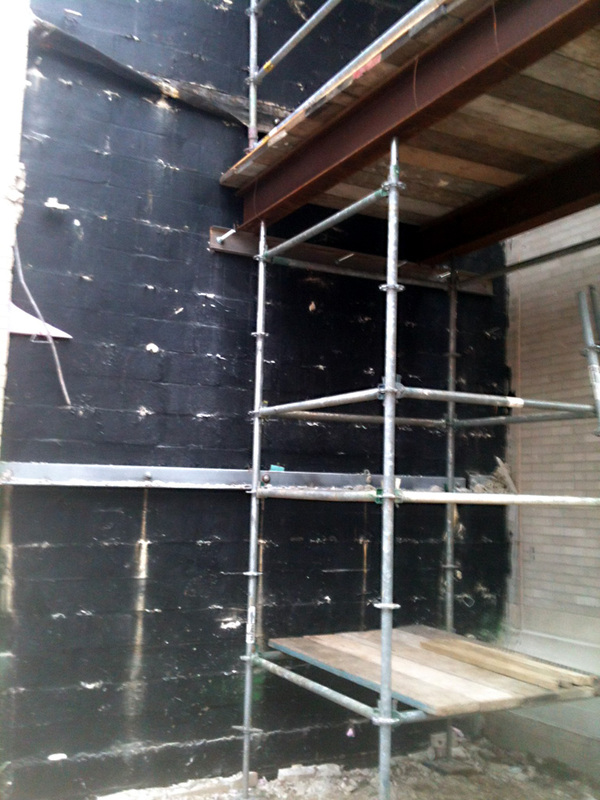 Those are just some of the challenges faced when erecting scaffolding around a busy building like this. For that reason, most of the work was done at night as pedestrian and vehicle traffic was diminished. I love this part of the description because we actually get to see BEFORE and AFTER shots of the scaffolding (something we don’t always get). 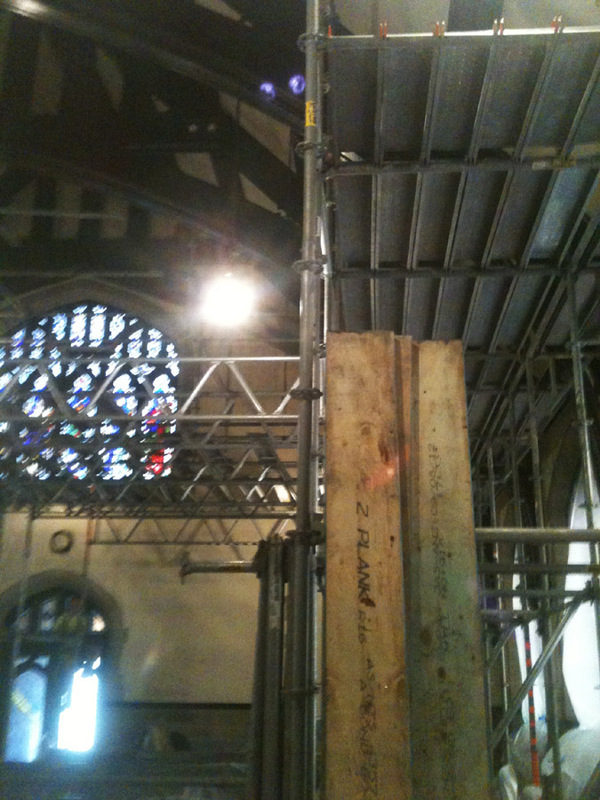 But this gives you an insider’s look at just what goes into scaffolding an historic building like this. It also lets us see some the challenges crews face. 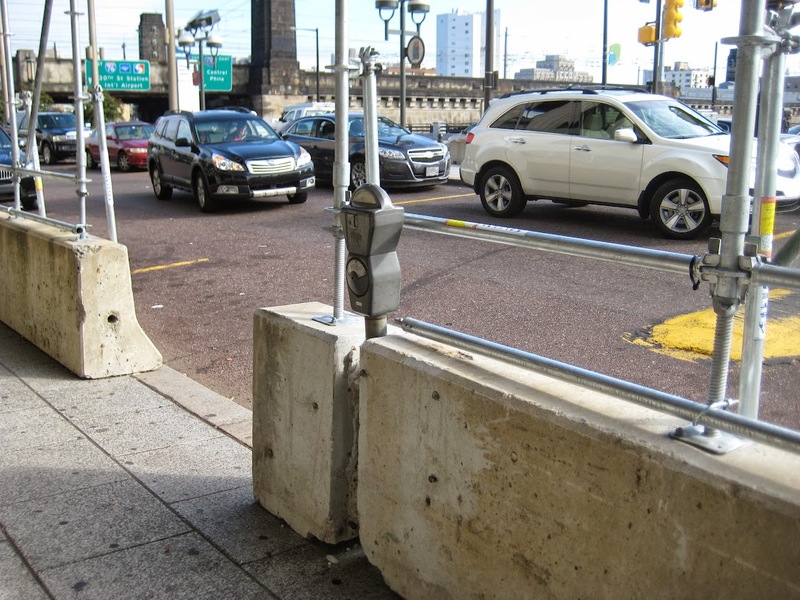 The jersey barriers on each side were quite the problem. 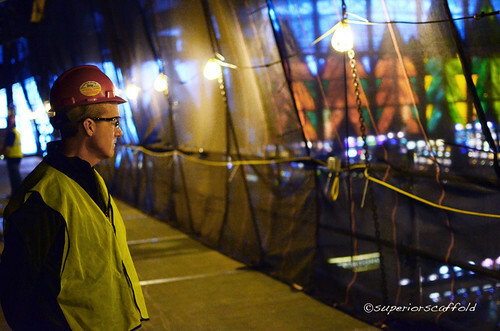 Superior had to scaffold around all the physical obstacles, lamp posts, bollards, parking meters, taxi cabs, pedestrians. 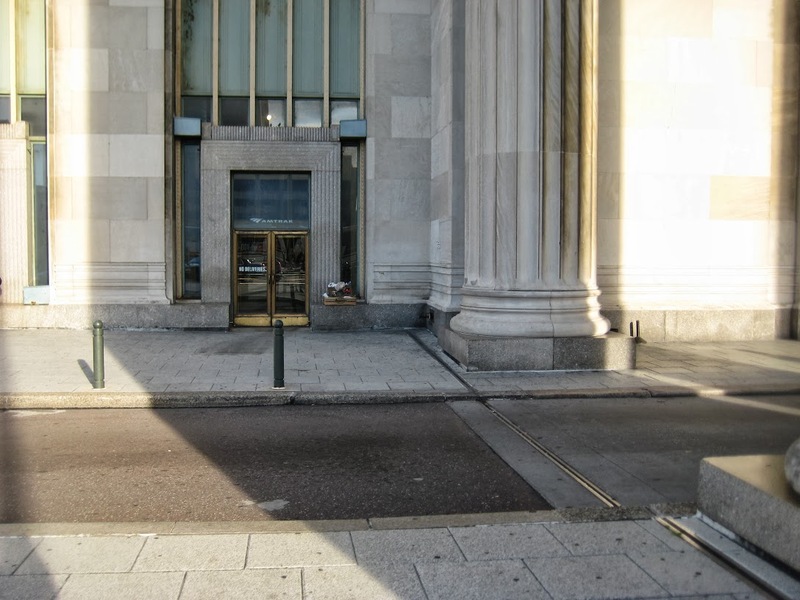 All of 30th Street Station is hollow underneath so Amtrak required Superior to build canopies on top of barriers to distribute weight load. 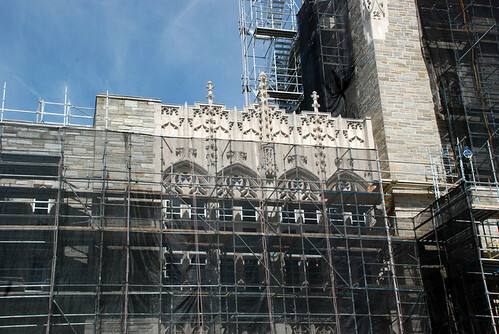 This was done so scaffolding can be installed on top of the canopy to do facade restoration. Amtrak even specified the type and color of paint…a beautiful soft green. Customizing the look and color of a canopy is an option that many of our clients choose. This is going to be an 8 – 10 year project. Superior had to construct overhead protection at different elevations for buses, cars and pedestrians. 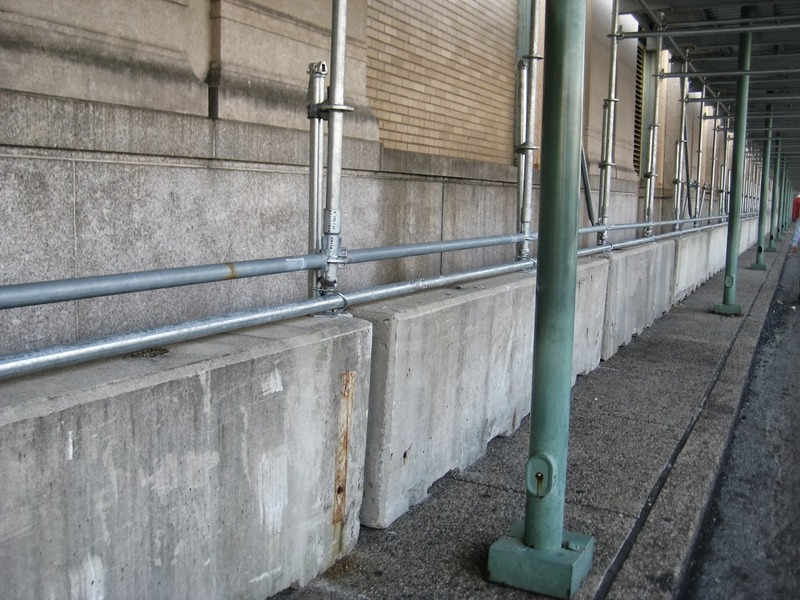 The biggest challenge was finding jersey barriers with one flat side as Amtrak mandated. Fortunately Rob Buckley from Buckley Construction had what the doctor ordered. 177 – 12′ barriers. Next challenge was setting them in place. We used a lull and a unique clamp made just for lifting the barriers. We also had to cut many of them to fit into Amtrak’s layout (parking meters, doors, etc.) It’s not easy cutting concrete barriers! Some shots to give you an idea of the scope of work with the canopies and overhead protection. Some of the detailed work that goes into doing an extensive job like this. 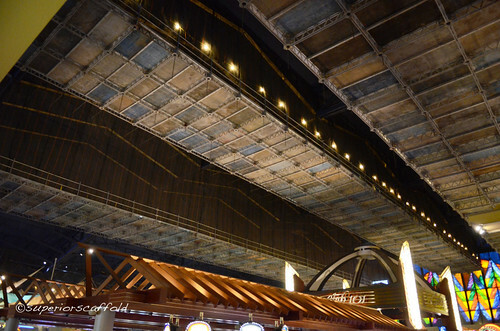 These structures are just the first phase in an extensive renovation. 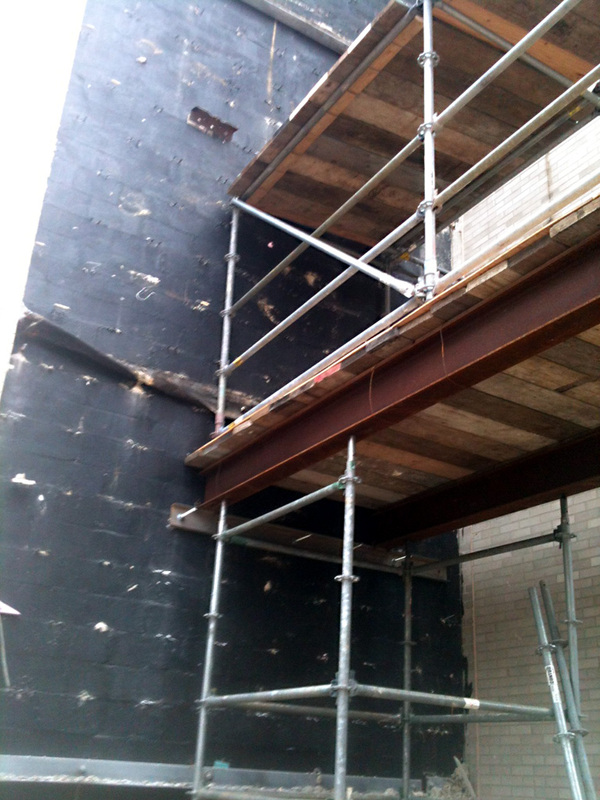 They have to be strong enough to support additional scaffoling when they start renovating the facade of the building. 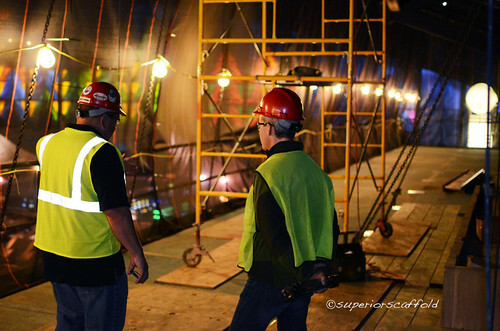 Superior provides scaffolding for renovations, inspections, new construction – just about any type of project. 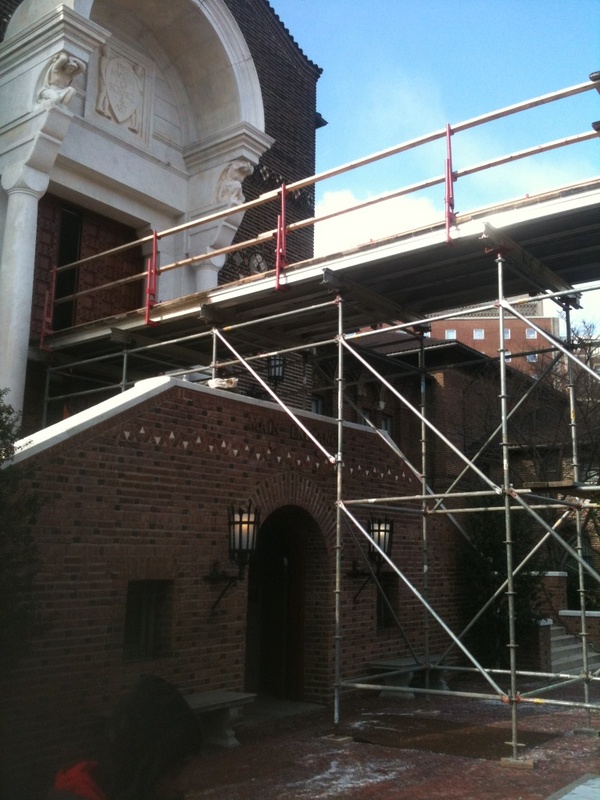 Give us a call today at (215) 743-2200 or visit www.superiorscaffold.com for more information. 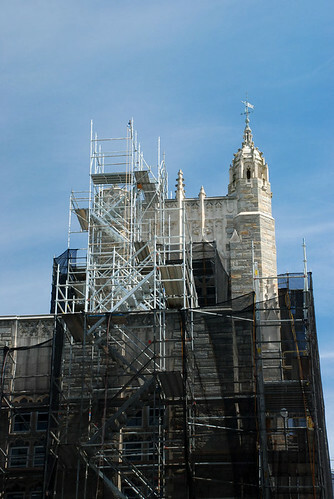 This is the last phase of the scaffolding and exterior renovations. and debris netting has been added. 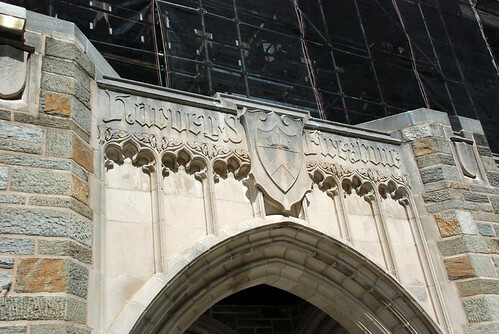 Superior Scaffold was selected to help in the renovation of Princeton’s Prestigious Firestone library because of its long history working with historic buildings on the campus. 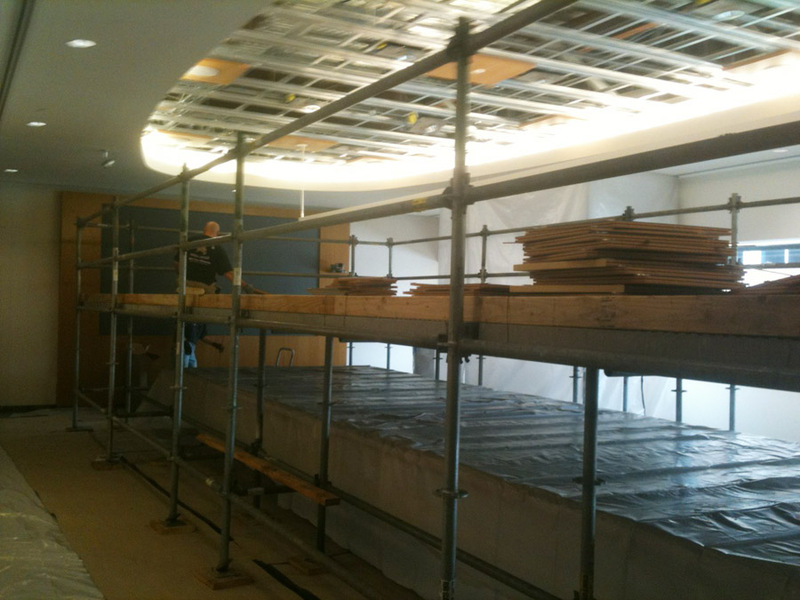 The renovation is a long-term project that is being done in multiple phases and will take almost 10 years to finish, during which time the library will remain open, and its collections available during normal hours of operation. This the back of the library. You can see just how large the scope of this scaffolding job is. 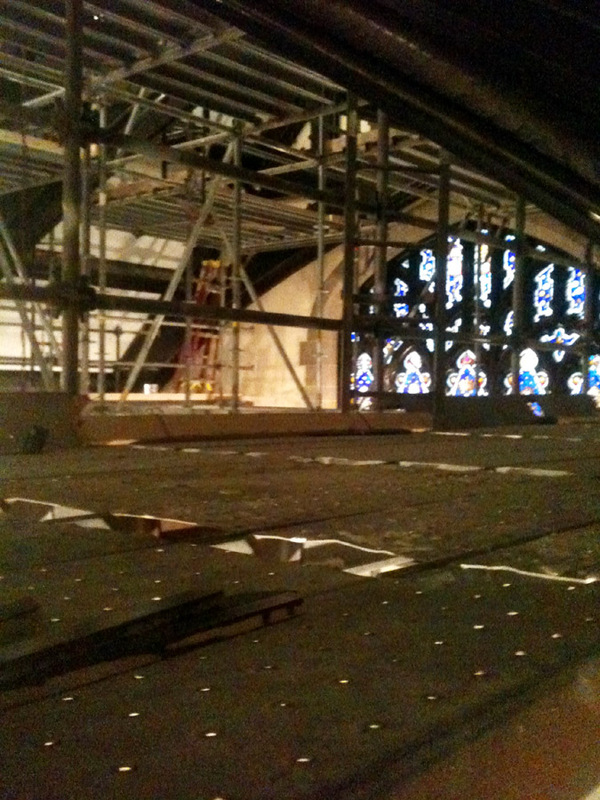 Superior erected as system scaffold allowing crews to get access to all areas of this monumental restoration. 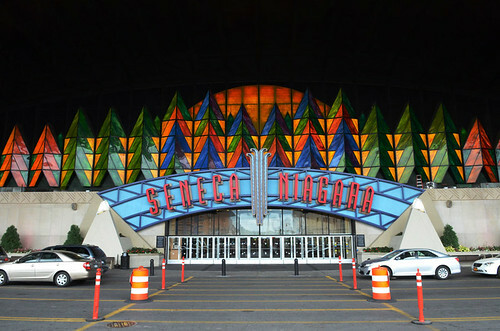 This is directly above the main entrance. 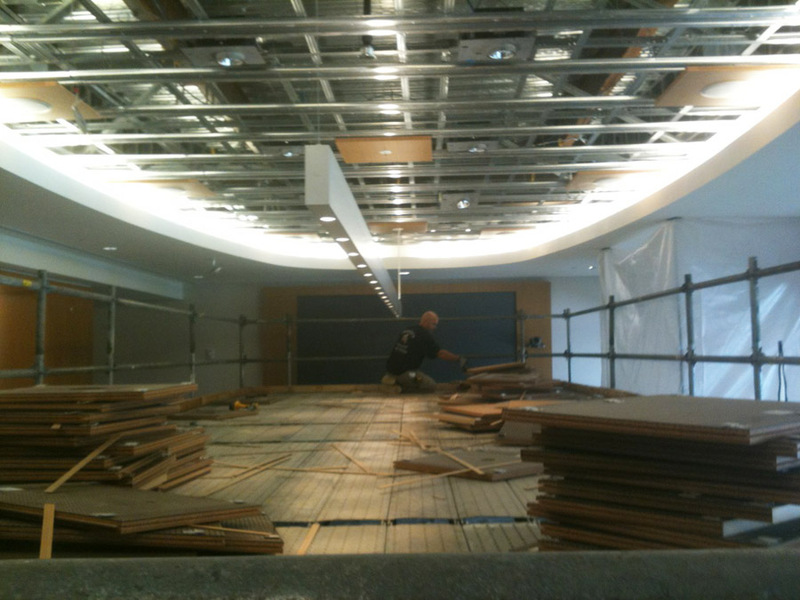 As stated above, the library has to remain open while crews do the work. 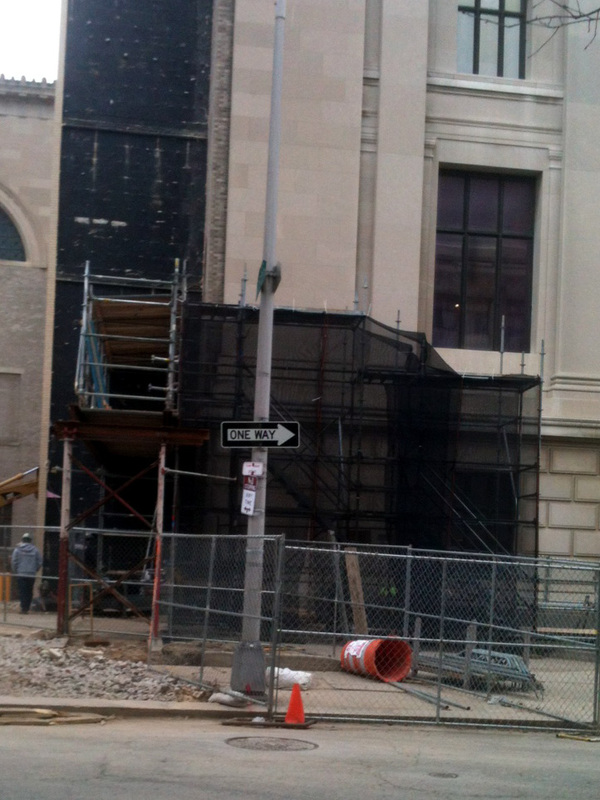 This is the right side of the Firestone Library – scaffold continues all the way around. 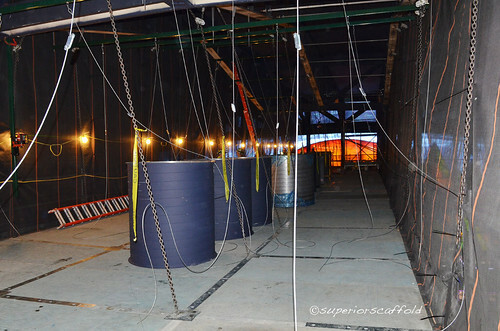 Superior also provided a series of debris netting and trash chutes to the project. Directly above the main entrance. The masonry work is outstanding. Everything will look like new when crews are finished. The Harvey S. Firestone Memorial Library opened in 1948 as the first large American university library constructed after World War II. 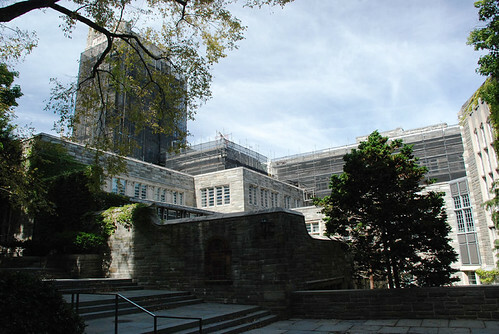 Roughly 1.5 million volumes were moved during the summer of 1948 from Pyne and Chancellor Green Halls, which until then had served as the University’s main library. 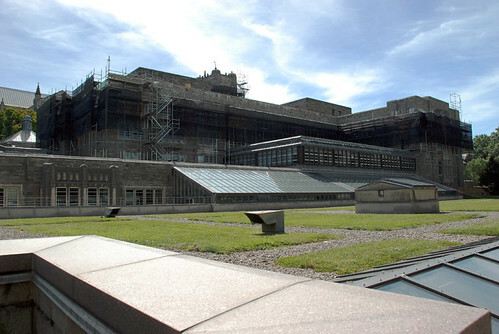 The library building was expanded in 1971 and again in 1988 and currently has more than 70 miles (110 km) of bookshelves, making Firestone one of the largest open-stack libraries in existence. 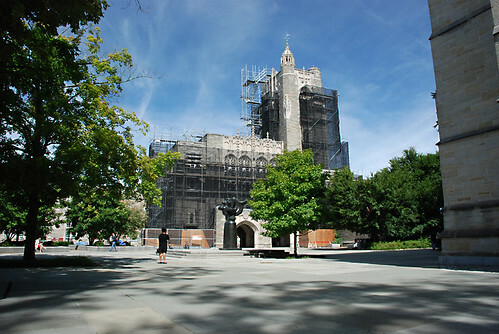 Though not the largest university library in the world, the library has more books per enrolled student than that of any other university in the United States. A view of the entire Firestone library from the back. The stair tower up to the top. 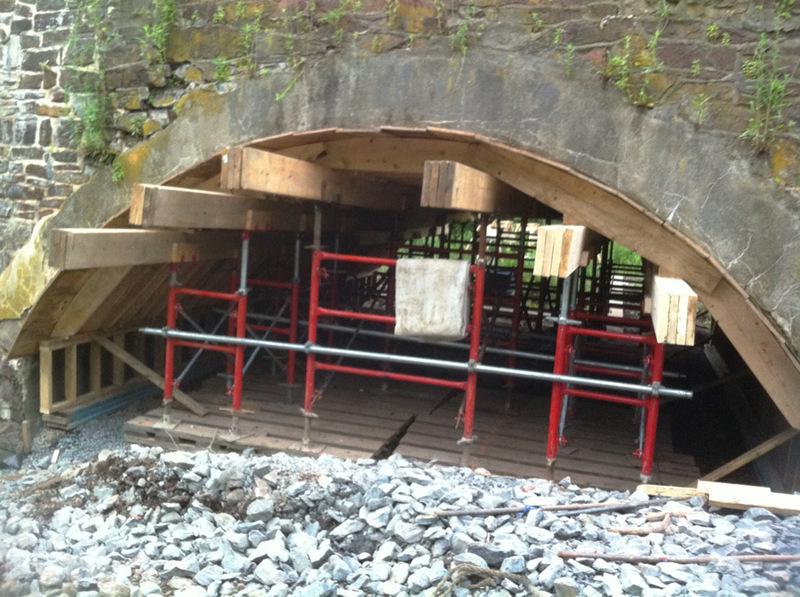 Triple the action for Superior Scaffold at the Old Dublin Pike Bridge in Doylestown, PA. 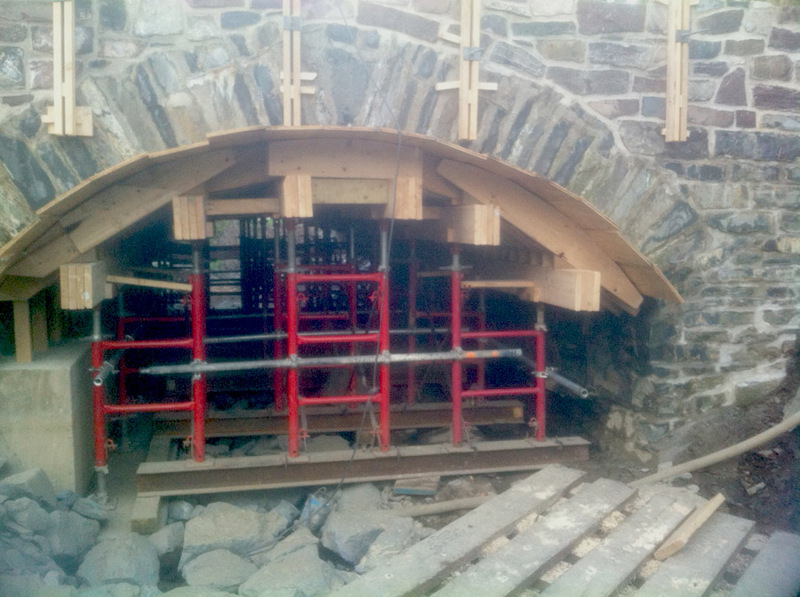 The stone arch bridge was originally constructed back in 1875 and then rehabbed in 1947. 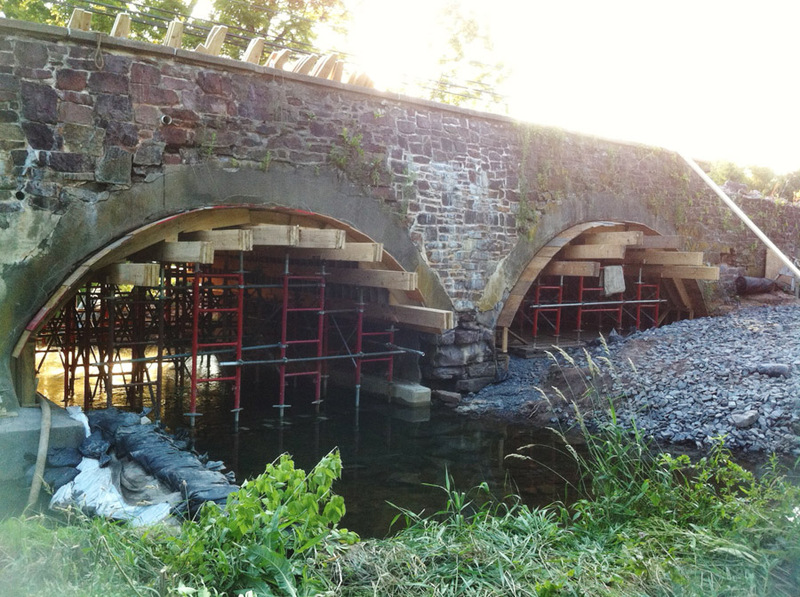 So it was time for a reconditioning – seems that this old bridge still has over 5,000 cars travel over her every day in Doylestown, PA. Crews needed a way to support the structure and to get into the arches to repair the stones and masonry while keeping the road open above. 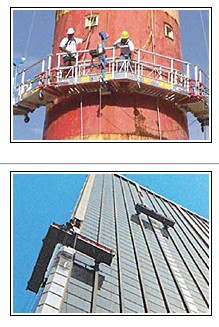 This was the challenge for Superior Scaffold. 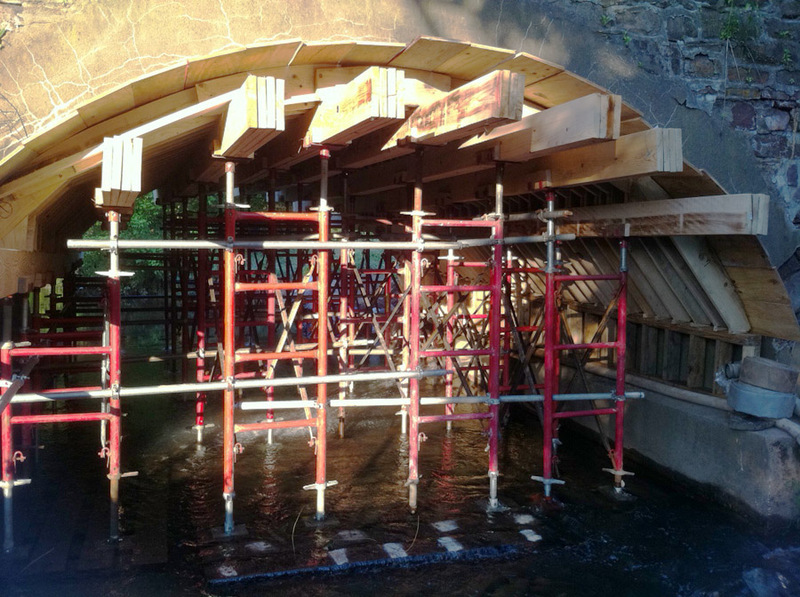 First order of business was diverting the river through two of the arches so one could be fairly dry while the scaffolding was erected. 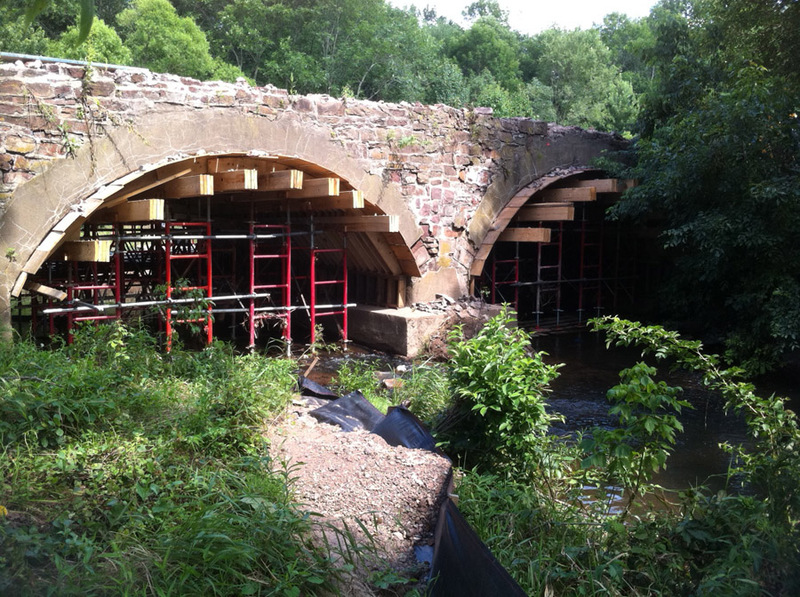 Then, once that was built, the water had to be diverted again so the second, and then third arch could be constructed. 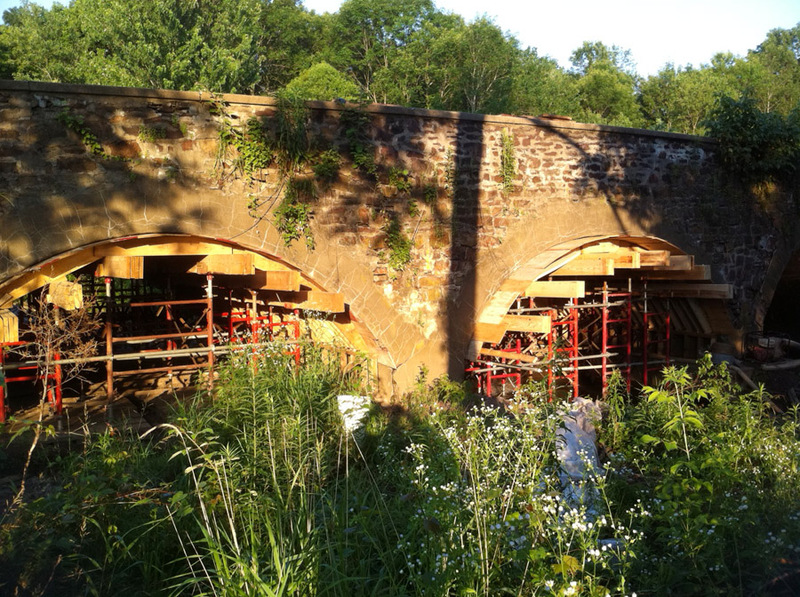 The next challenge was how to best shore up the arches so work could be completed but also support enough weight for heavy machinery traveling the road over head. 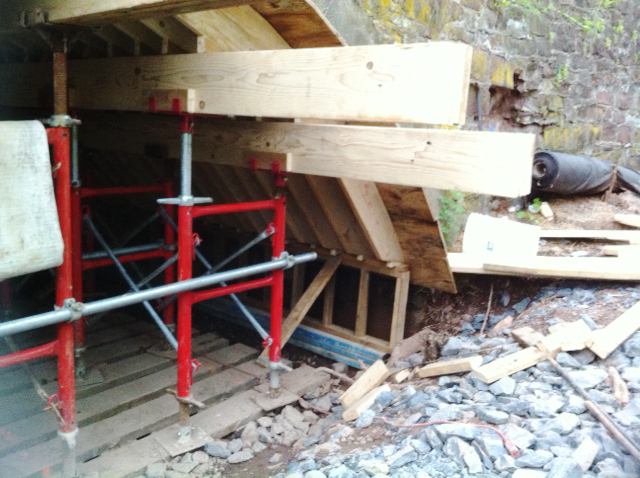 Superior engineer Bob Robinson decided on 20k scaffold frames to hold up the shoring beams and wood supports. 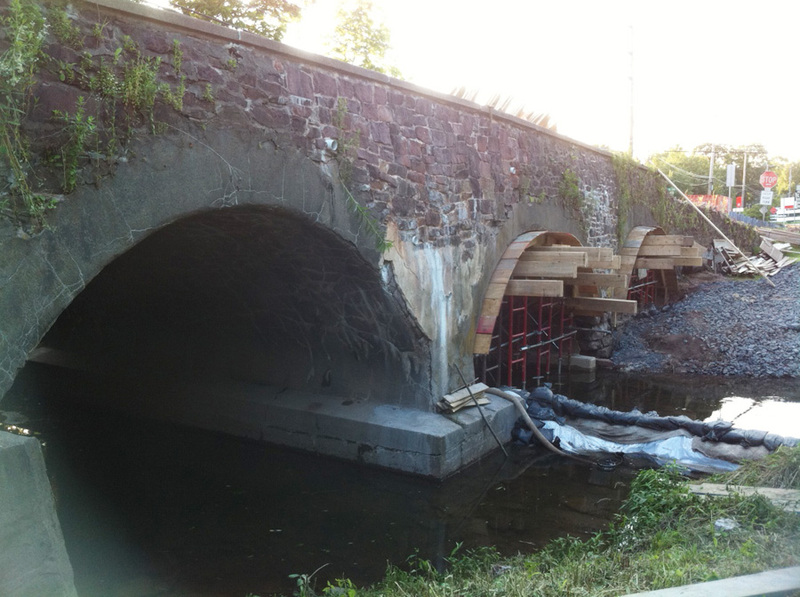 It allowed the road to remain open for business while construction crews completed the work below. It’s a unique way to solve the problem and keep a major thoroughfare open. The job went off without a hitch and the mighty river is flowing once again and cars are happily traveling over the old bridge in Buck County. 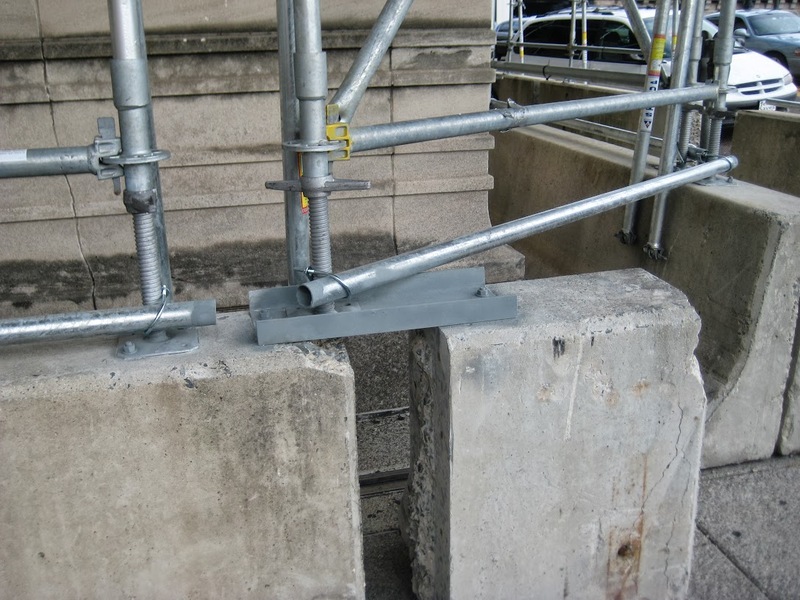 Call Superior Scaffold at 215 743-2200 or go to http://www.superiorscaffold.com for all of your scaffolding and shoring needs. Who would have thought that the 1960’s cult hit from the band The American Breed would have been a perfect fit for this suspended scaffold job at the CityView Condos. But once you see what Superior Scaffold can do with modular swing stages you will understand the significance of, “Bend me, Shape Me”. Every now and then you run into a job that doesn’t have a flat surface – like here at 2001 Hamilton St, Philadelphia, PA 19130. The building is unique, in that, it has 45 degree corners. 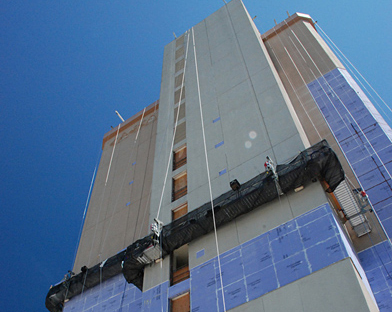 This poses a challenge for most contractors trying to do any façade or window work. 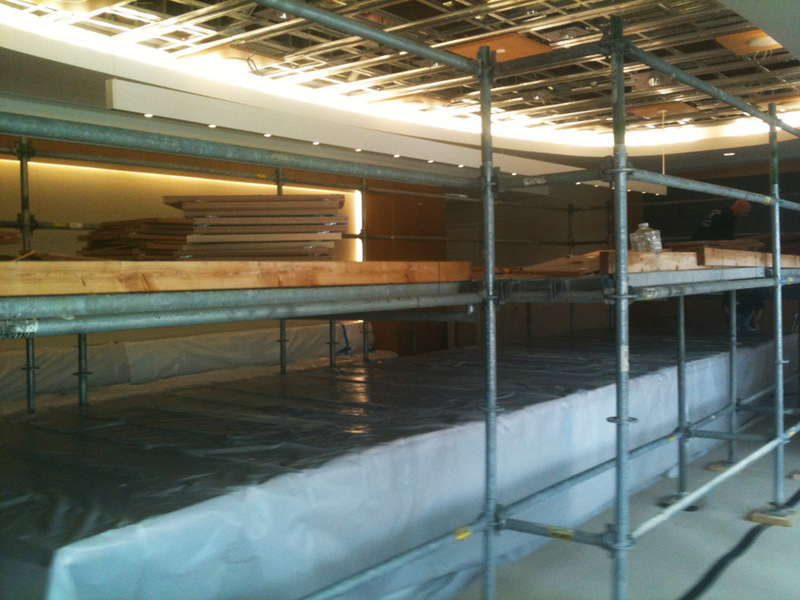 But with our staging we helped the contractors configure this job with the least amount of suspended scaffold. 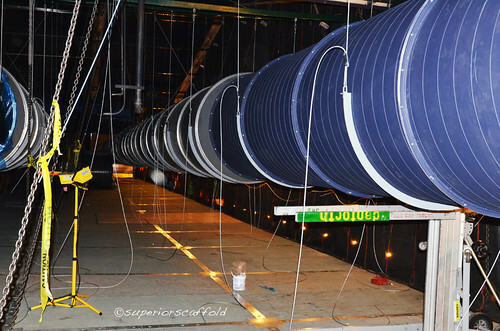 We have the ability to configure the swings to almost any shape. Thanks to our friends at who provide us with the necessary equipment to make that happen. Take a look at some of these photos. 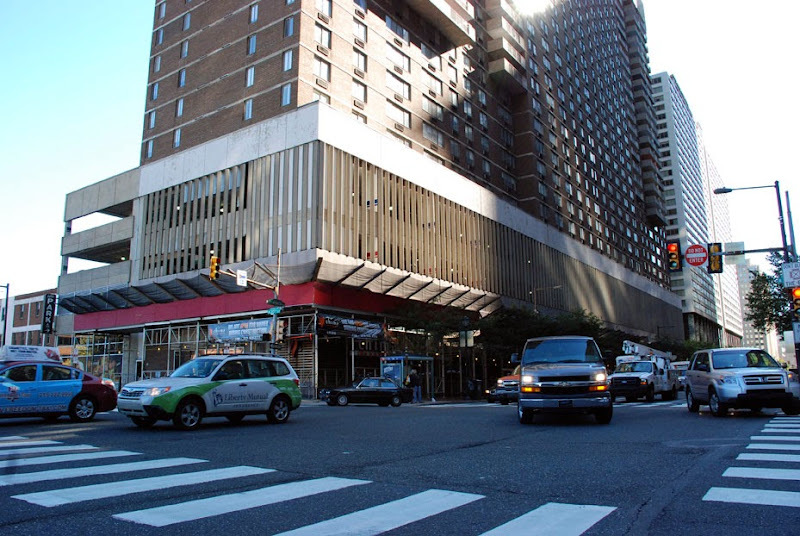 This particular building has a total of 8, 45 degree corners and is approximately 240 feet in length. 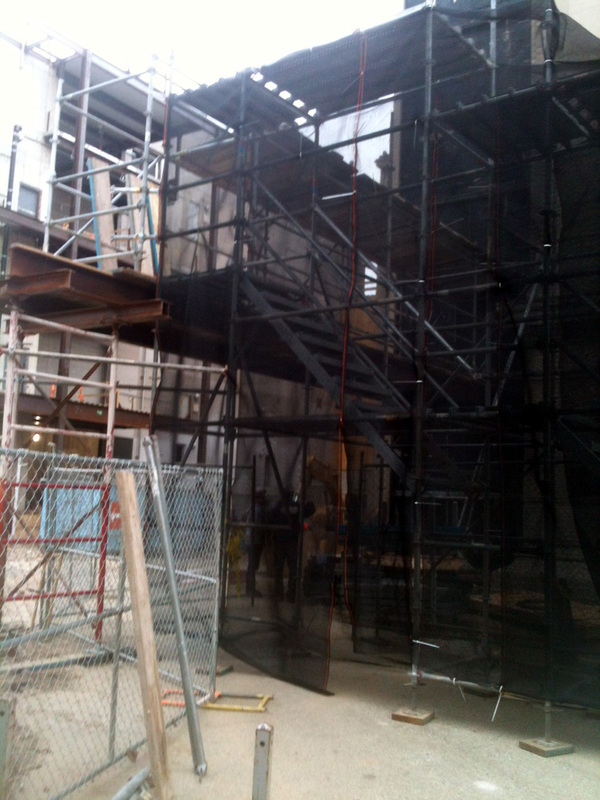 We were able to cover then entire building using 6 suspended scaffolds. 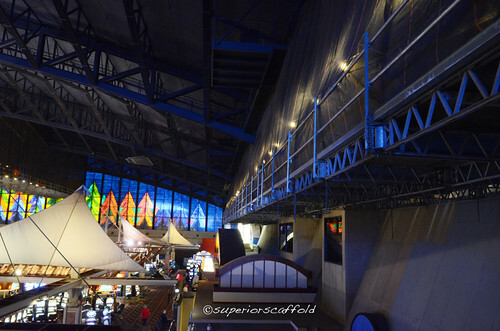 Superior scaffold also provided 400 ft of overhead protection. 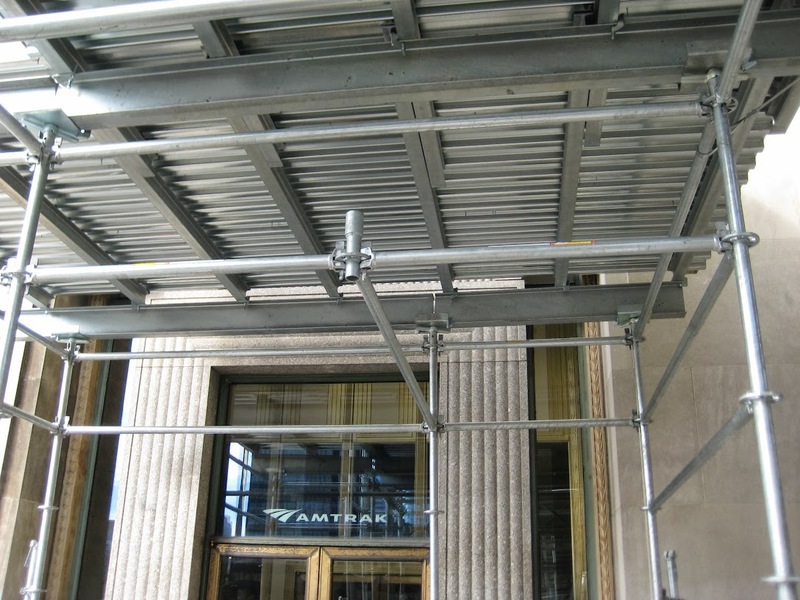 Think about Superior Scaffold’s ability to custom fit any swing to access those hard to reach areas. And for those nostalgia people – check out these videos. 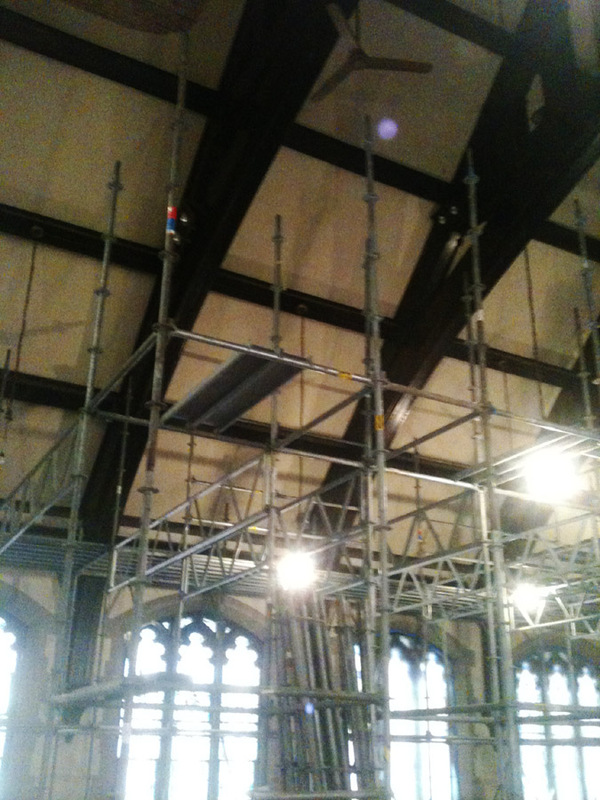 This neat old church at 1064 Penn Ave, in Wyomissing, PA, that began its life in 1909, needed some repairs to the high vaulted plaster ceilings – so they called Superior Scaffold. 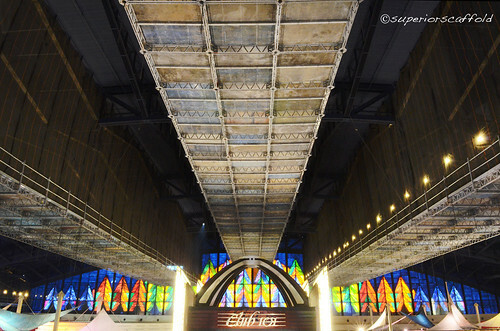 The ceiling was divided into sections with flying buttresses, so the layout had to be spot on accurate. 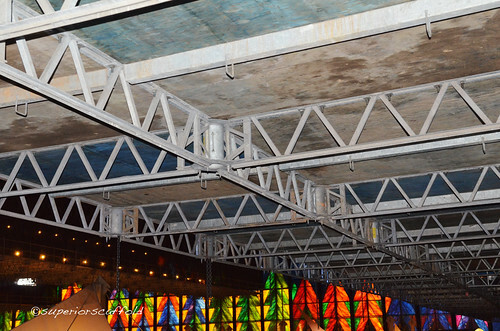 We used system scaffold with joists and plank to not only get to the hard to reach places but to also build a solid platform or dancefloor for the workers. The steep, sloped, plaster ceilings had new sheetrock added over the old plaster, and then they were textured and painted. This gave the old girl the dress up she needed for the next 100 years. 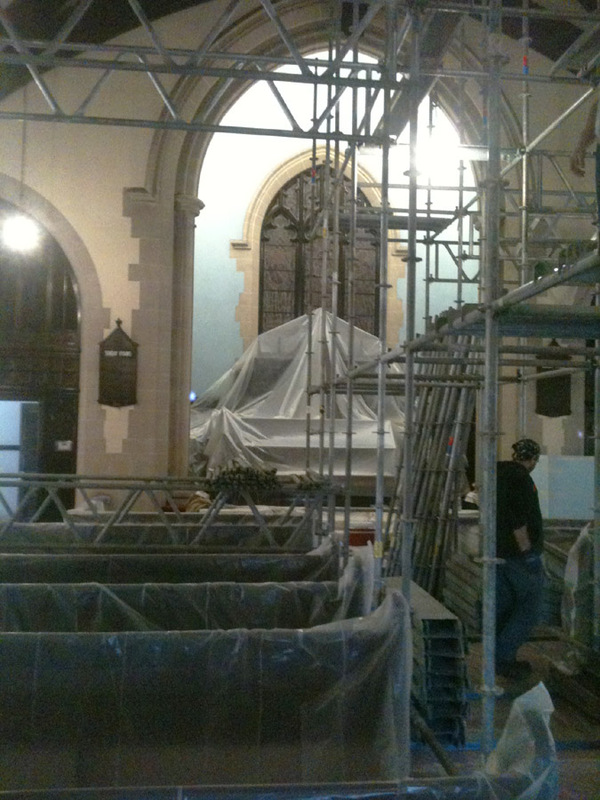 We were proud to bring our skills and experience working with historic buildings to Bausman Memorial United Church of Chris. A little history on this church. 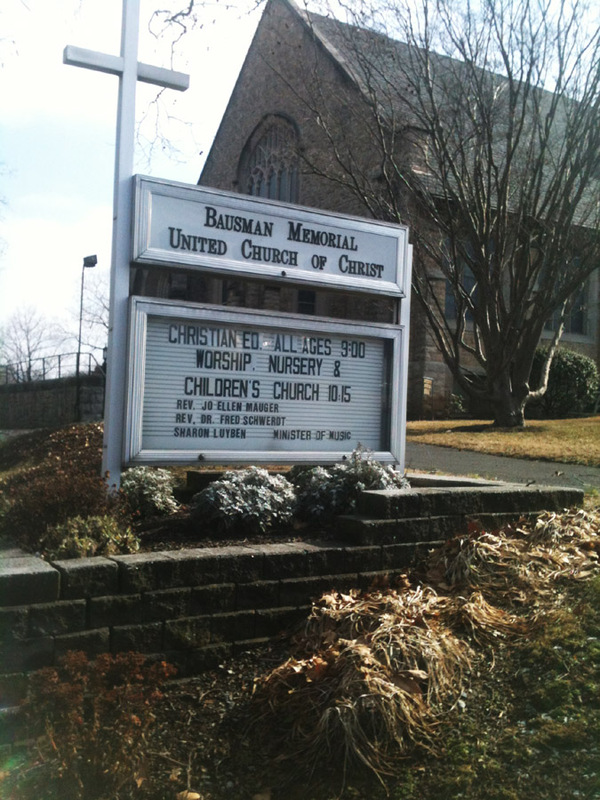 Bausman Memorial United Church of Christ is part of a denomination which is a merger of the Evangelical and Reformed Church and the General Council of the Congregational Christian Churches of the United States. 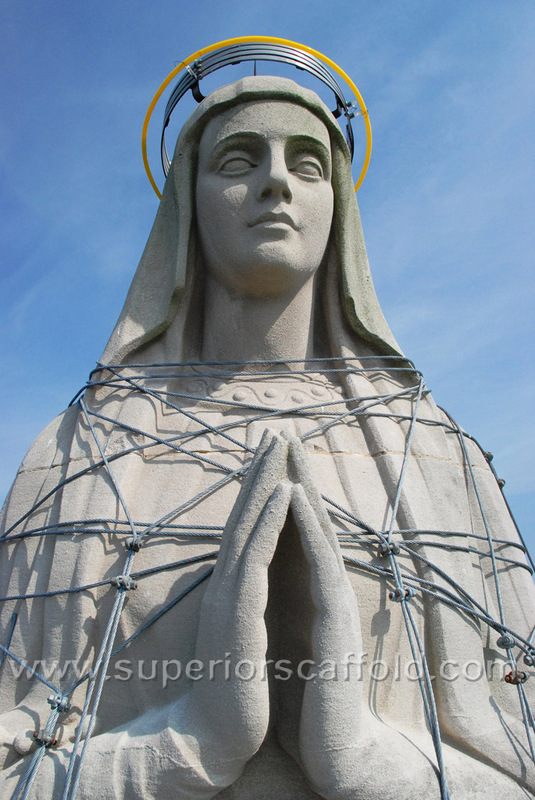 Construction of a small church began in 1909 and it was dedicated in 1911. As the congregation grew, members decided to complete the church building with an addition begun in 1922. 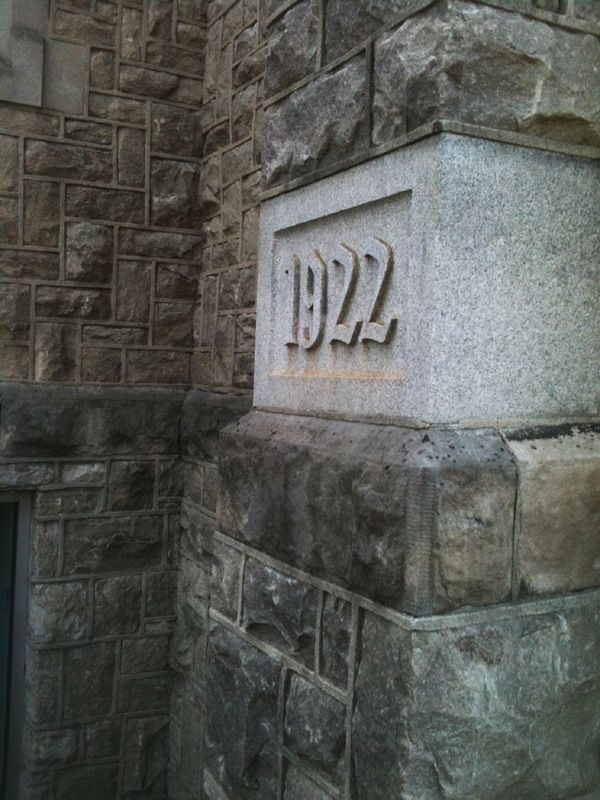 The completed building was dedicated in 1924. 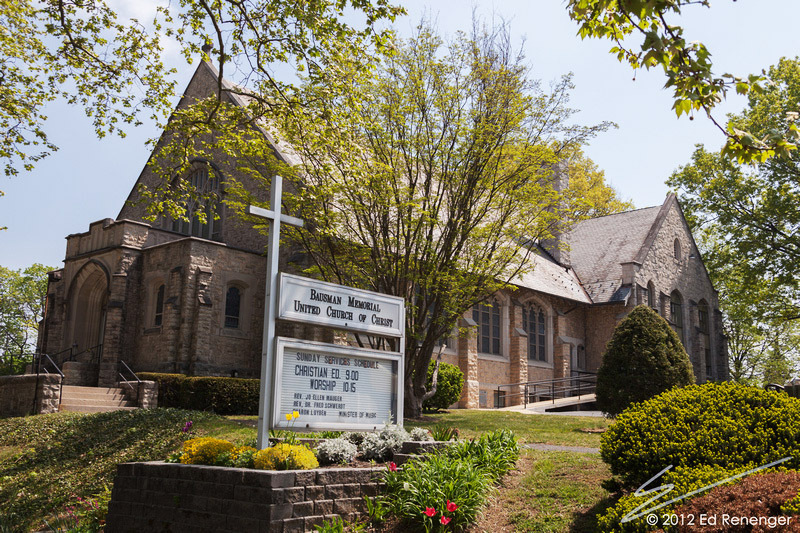 Bausman Memorial United Church of Christ is a church of diverse learners seeking answers to life’s questions based on the teachings of Christ. We nurture each other with respect, share with each other as family, and engage God and others in worship, music, study and in service. Every Sunday we offer Church School programs for all ages at 9:00 a.m. and gather for worship at 10:15 a.m.
Changing ceiling tiles is MMM MMM good at Campbell’s Soup Headquarters. This is one of those, once in a lifetime, cool jobs that you just have to brag about. 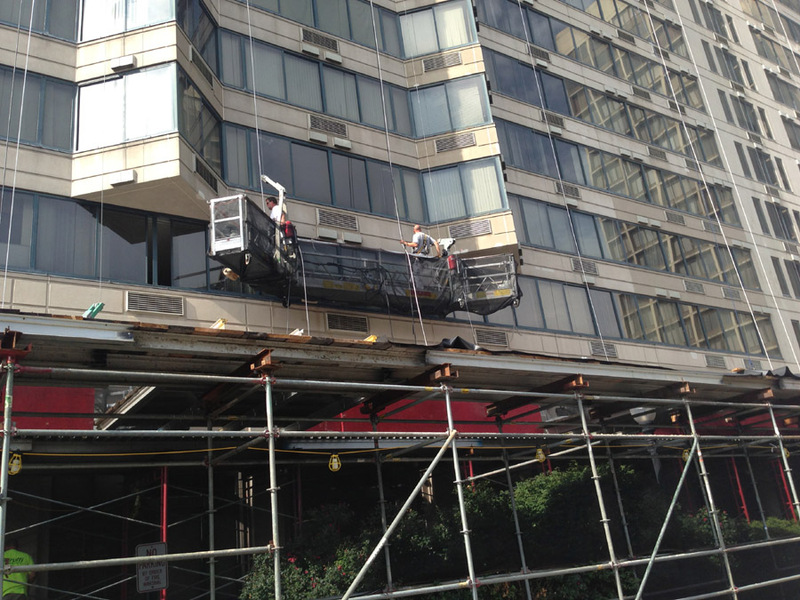 Superior Scaffold was called out to the Campbell’s Soup Worldwide Headquarters in Camden, NJ to rig a special scaffolding in the boardroom. 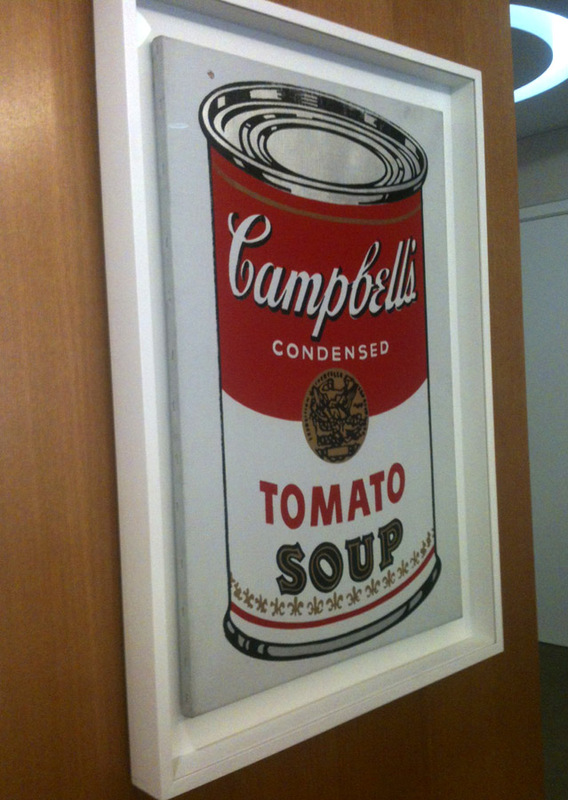 This is the same boardroom where one of the original Andy Warhol Campbell Soup Can paintings lives. And even cooler was the job. 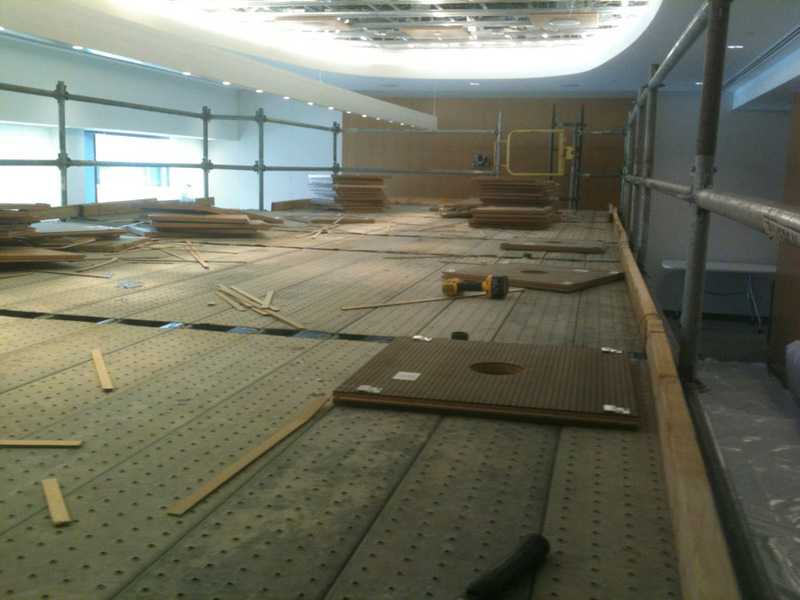 We had to come up with system to allow crews to change the ceiling tiles over the handmade wood table that resides in the boardroom. Sounds simple, right? Not really. The table is 8 feet wide by 30 feet long and could not be moved. It was hand picked by the Dorrance family (heir to the Campbell fortune) and cost over $100,000. Needless to say, they needed a company with a history of preserving priceless artifacts to erect scaffolding around this table without causing any damage. The table was first protected with poly, then foam, and then plywood as a precaution. 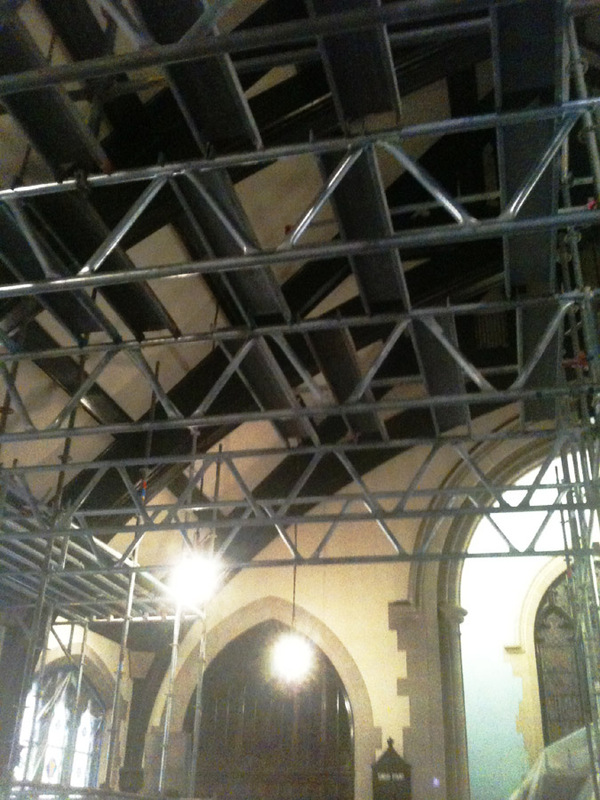 Superior built scaffold over and around the table using 2 foot wide X 34’ long towers on either side and then connected them with 10’ trusses. This made a solid platform. 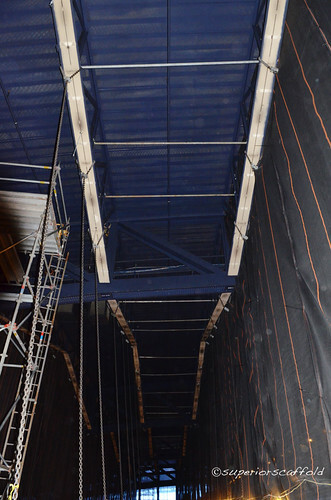 “Then we decked it in solid – so the crews would have a nice safe place to work,” said Superior estimator, Pat McAndrew. They decided to install long life light bulbs while they were up there. The job came off without a hitch and the Warhol is back presiding over the elegant table (with new lighting and ceiling tiles in place). On January 26th, Superior Scaffold was proud to help bring to the East Coast one of the most incredible Roman Mosaics ever unearthed. 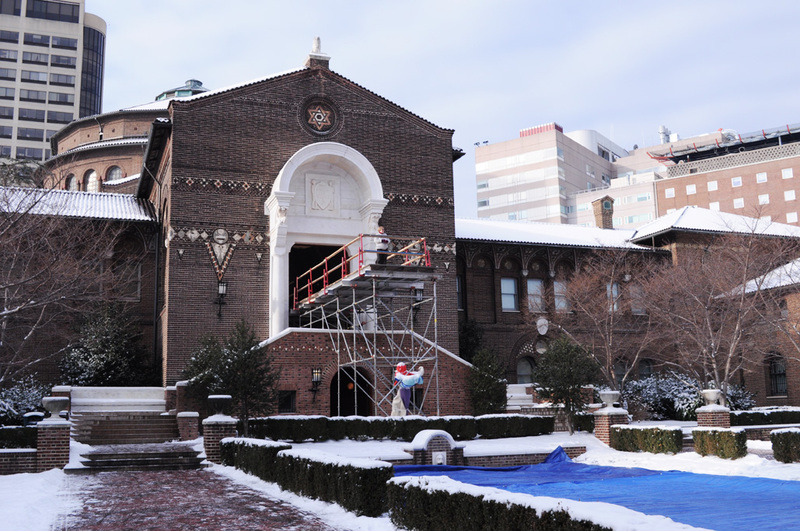 The challenge to get them inside the University of Pennsylvania Museum of Archaeology and Anthropology was something of an engineering marvel taking scaffolding teams, crane operators, art curators, engineers, and scores of people. But first… A real-life “Cover up”. In 1996, workmen constructing a new highway in Lod, Israel (near modern-day Tel Aviv), made a shocking discovery: a 1,700 year old Roman mosaic under the surface of the road. At that time, the Israel Antiquities Authority conducted a rescue excavation that revealed a full series of mosaic floors, measuring roughly 50 feet long by 27 feet wide. Conservators provided preliminary treatment of the mosaics, but they were then reburied until funding could be secured for the full scientific excavation and conservation. In 2009, excavators unearthed the Lod Mosaic once again. The mosaics were then separated into panels and rolled away from the earth. Today, they remain in near perfect condition. Three of these panels are on display in Unearthing a Masterpiece. This piece is very unique because it lacks human figures. It was likely commissioned by a high-standing Roman official for his private home. 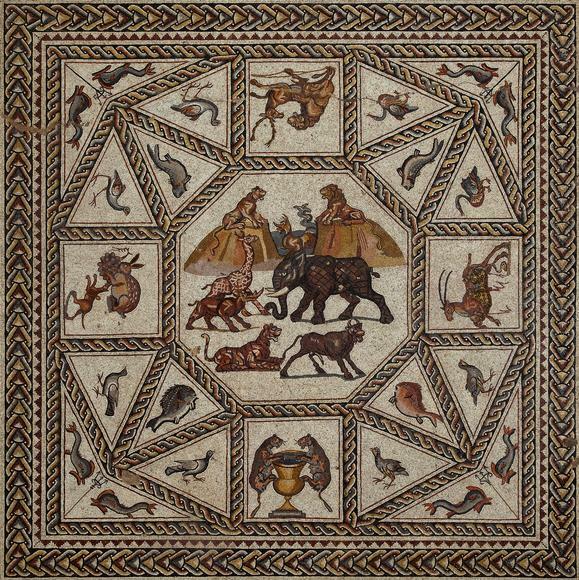 Alluding to gladiatorial games, the mosaic panels depict scenes of hunting, trading, and marine life. And because these tiles date back to 300 CE and are some of the most complete, well-preserved, and largest Roman mosaics ever found, everyone involved wanted to keep them that way. 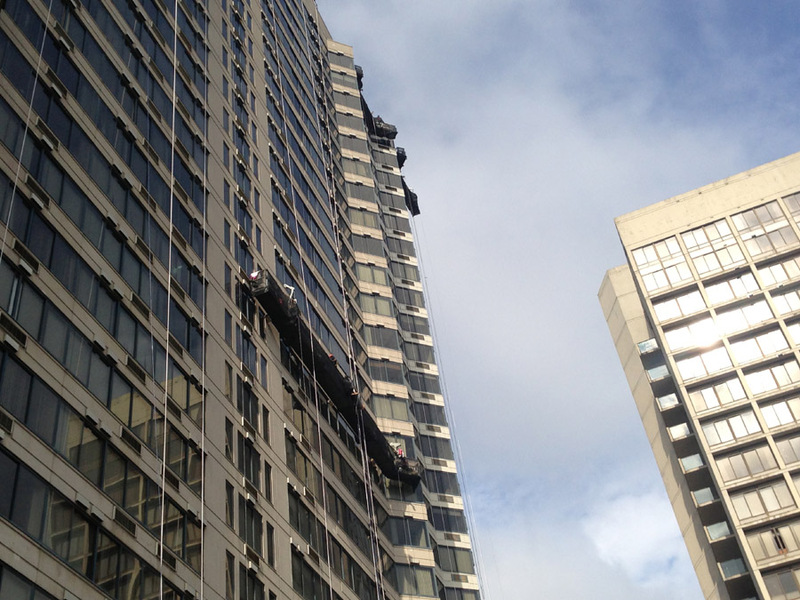 So the call went out to Superior Scaffold to help get them into the building. Piece of cake, right? Wrong. Follow the photos below to see just what was involved. Now, we were just one cog in a very important machine. But our piece was of utmost importance. These tiles were so large that they had to be placed into 7 gigantic wooden crates and shipped to Philadelphia. 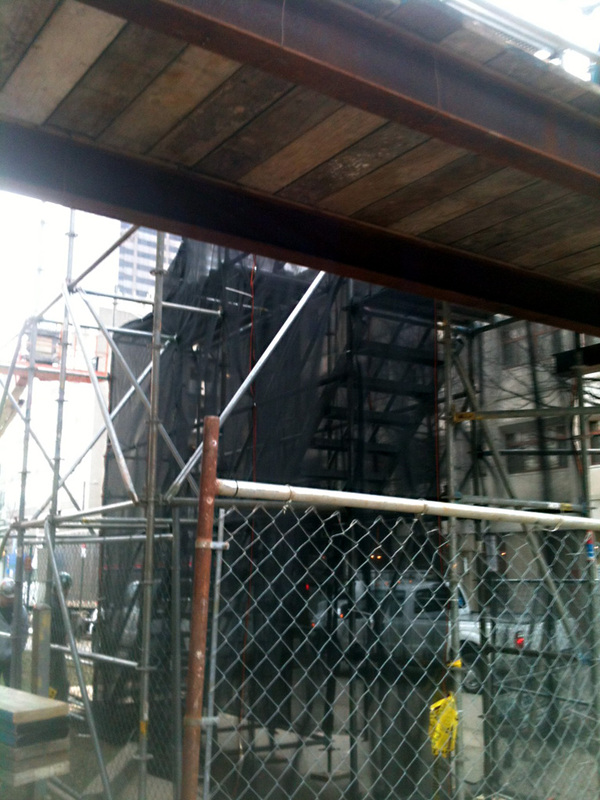 And on the morning of January 26, 2013 two large box trucks arrived and blocked South Street in front of the Museum. 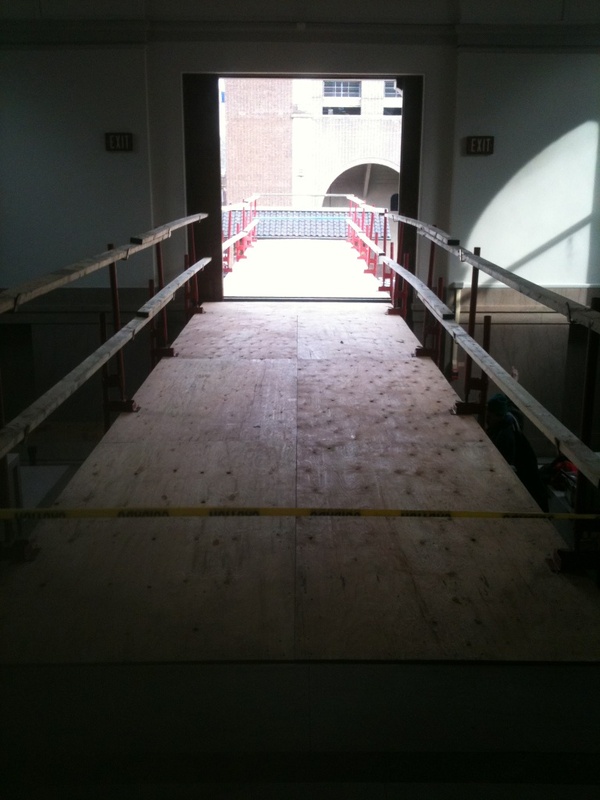 The biggest challenge on this job, that required weeks of careful planning, was that these crates couldn’t just be waltzed through the loading dock and up to the third floor where they were going to be displayed. They were way too big and heavy to fit. 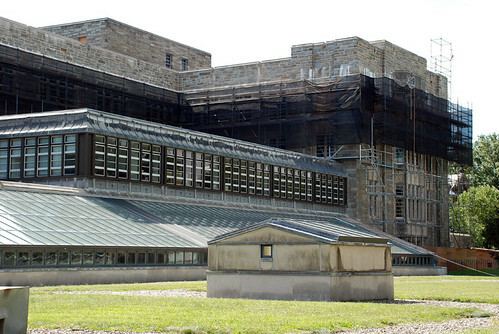 They had to be hoisted by a 100 foot crane up off of South Street and deposited onto a giant 16’ tall platform that Superior built over the main stairs and Warden Garden Coy pond that straddled two giant sliding wooden doors accessing the grand staircase on the third floor into the Pepper Gallery. Wow, that was a mouthful. But seriously, look at the photos. 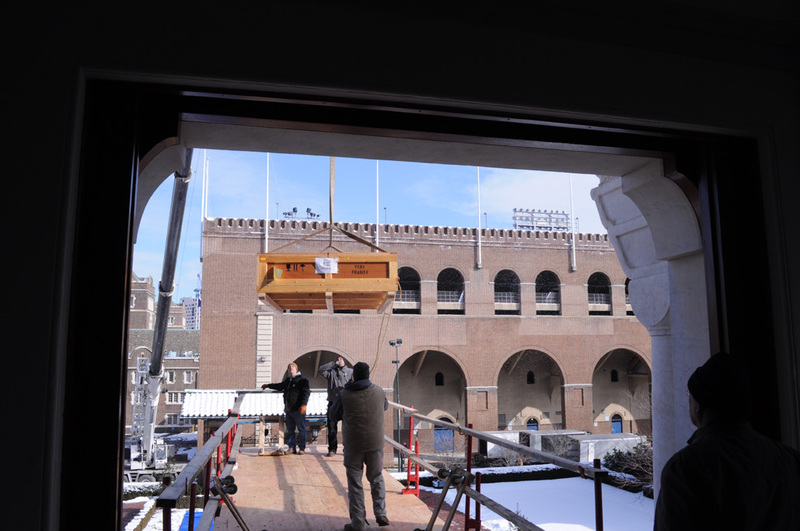 Superior’s platform allowed the giant crates to be maneuvered directly inside to the display area where curators could uncrate the masterpiece and put it together for display. 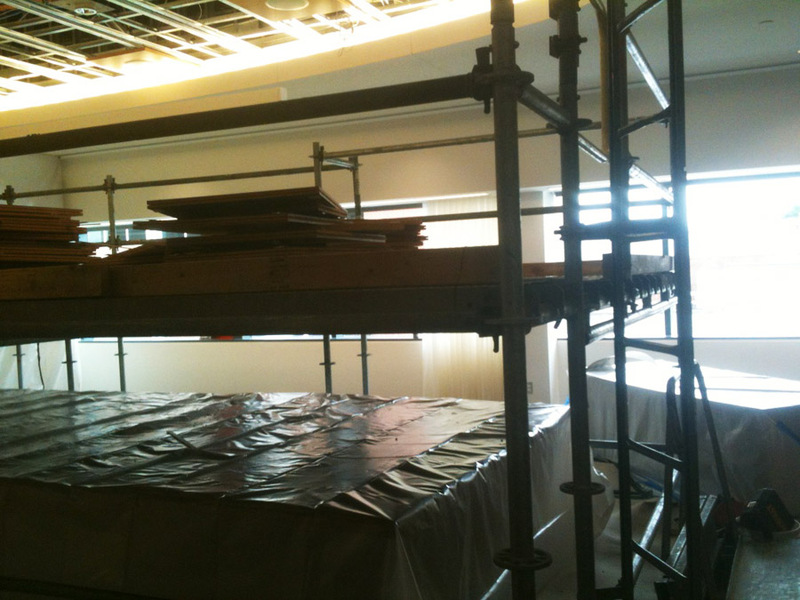 Sitting on top of the system scaffold, Superior used 9’ aluminum stringers crossed with solid plank and then topped with plywood. Then entire unloading process took approximately 6 hours. Of course, our part started long before the trucks arrived and lasted well after the crates were unpacked. 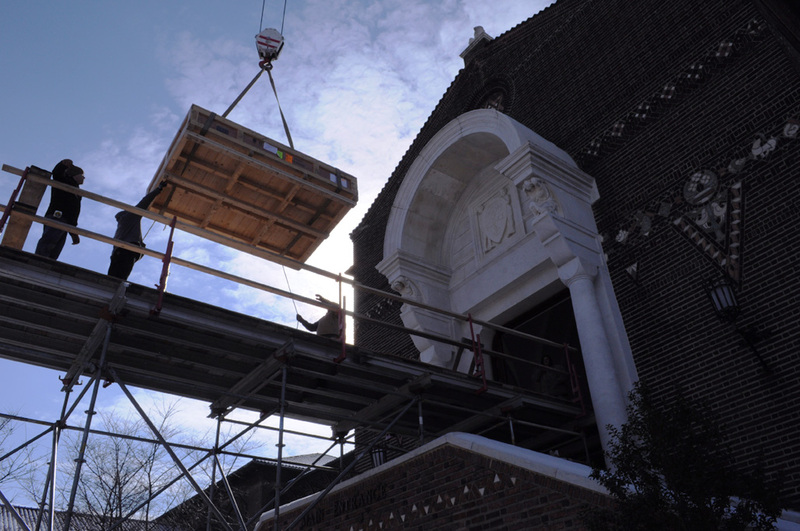 In the end, the Museum safely unloaded, unpacked, and assembled the Mosiac in time for their ribbon cutting ceremony on February 10, 2013 to start the exhibit (Unearthing a Masterpiece: A Roman Mosiac from LOD, Israel) which runs for a limited time. Estimator Pat McAndrew not only oversaw the installation but also attended the opening where he took these photos of the famous Mosaic. 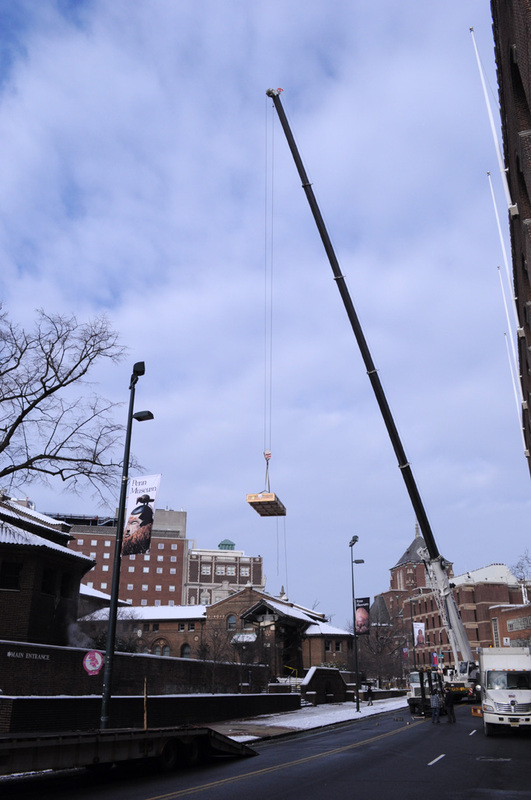 And a shout out to Bob Thurlow in charge of Traveling Exhibits at Penn Museum for some of the great photos of the crates going in. If you would like more information about the unearthing of the LOD Mosaic click here. 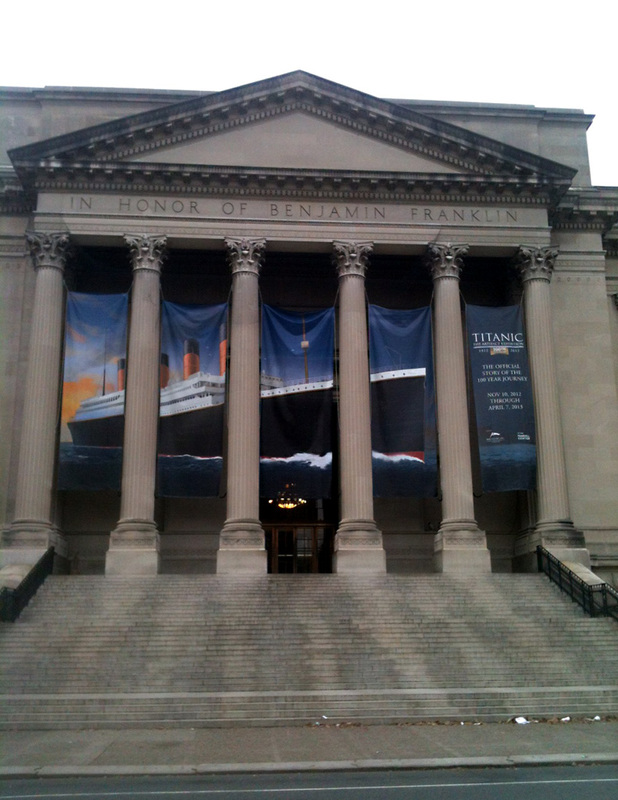 The Franklin Institute is a museum in Philadelphia, Pennsylvania, and one of the oldest centers of science education and development in the United States, dating to 1824. The Institute also houses the Benjamin Franklin National Memorial. 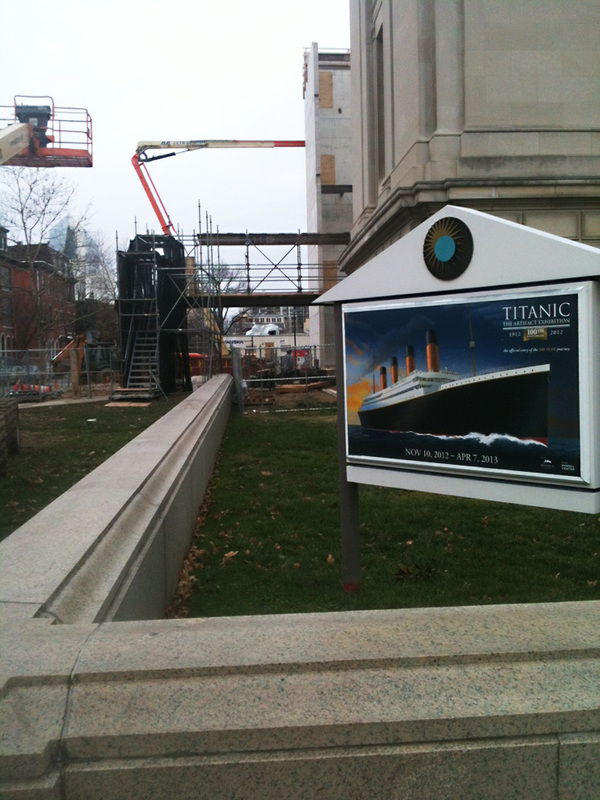 They are currently hosting the Titanic Artifact Exhibition – and they are putting a new addition onto the side of the building. 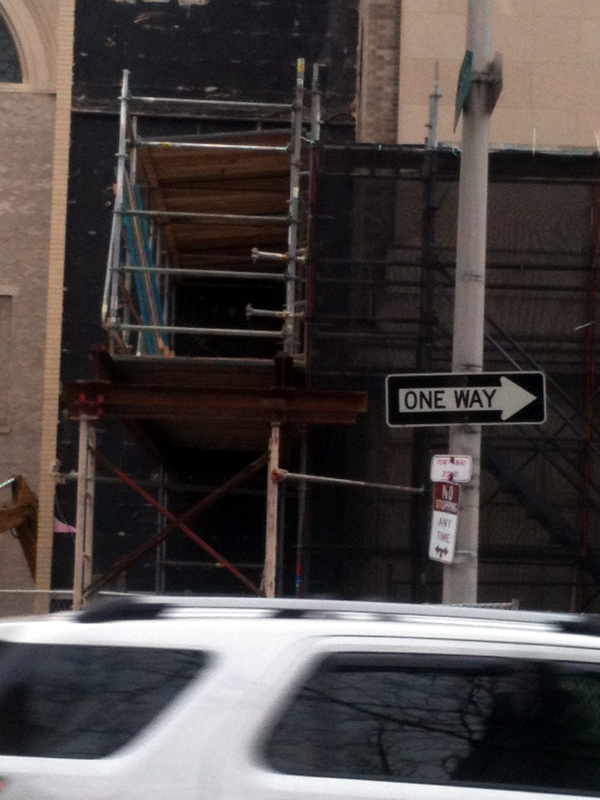 This is where Superior Scaffold comes in. 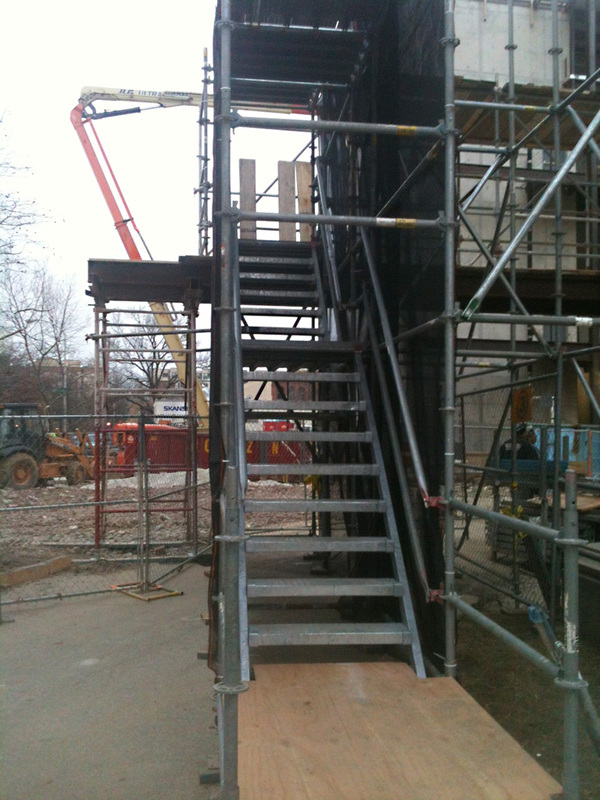 The needed an emergency egress – to put it simply, an emergency exit stairwell from the second floor down to the ground. Sounds simple, right? Of course not. Why? Because the ground beneath the proposed emergency stairwell is being excavated. Something about spy tunnels from the old Manhattan project that run from the basement of the Franklin Institute across the street into the basement of another building. Now, this is just conjecture offered up from some unnamed sources on the job. But just think about it. How cool would that be? Since I can neither confirm nor deny these allegations we can only assume that Oppenheimer and his crew were shuttling top secret plans back and forth while developing the world’s most destructive weapons. 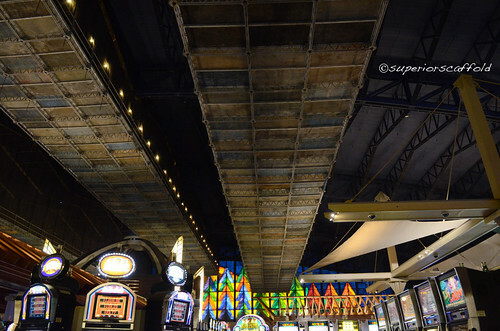 Or it just could be that something beneath the ground needs to be removed or updated for structural reasons. Stairs, water pipes, electrical, who knows? You make the call??? Maybe Jerry Bruckheimer should make a movie. 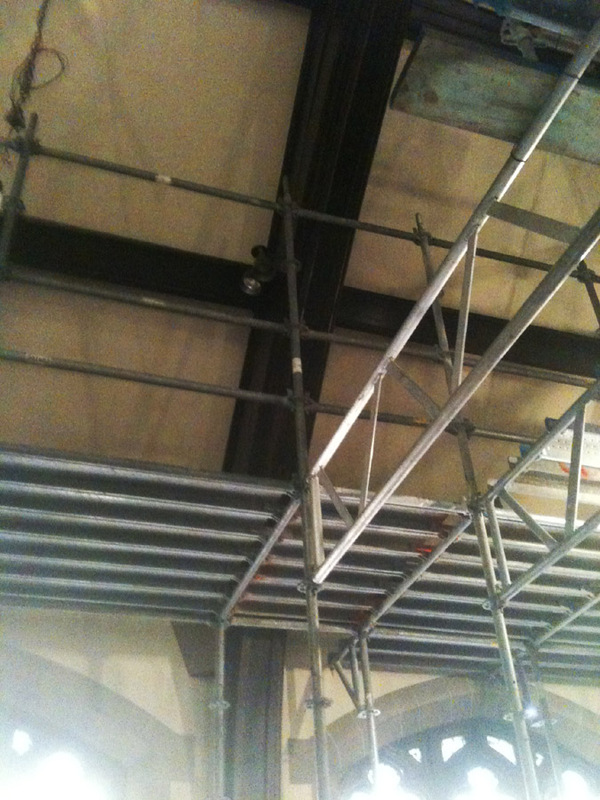 Superior Scaffold stars in: Ha. 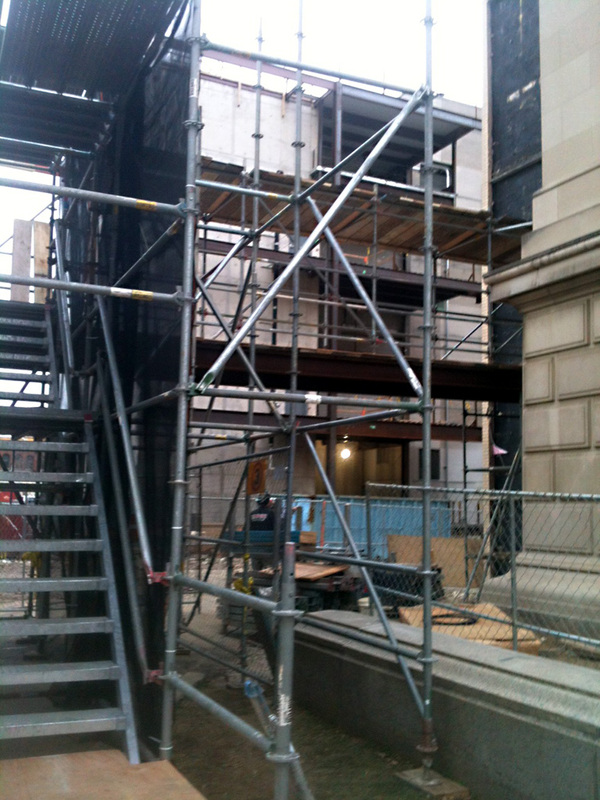 Either way, the egress could not be built straight from the second floor down to the ground. 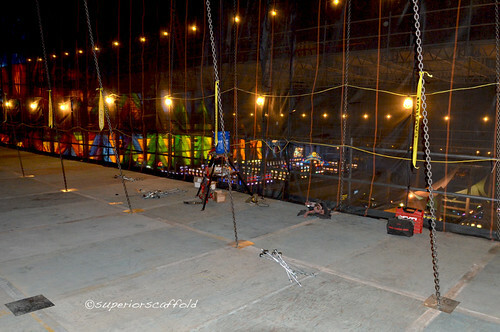 This is where the creative chaps at Superior Scaffold come in and design a scaffold that spans the 36’ area that’s being excavated and then takes you down to ground level. Since they had to span the gap – they designed a free standing 4′ X 5′ X14′ high unit that sits 40’ away from the exit of the building. 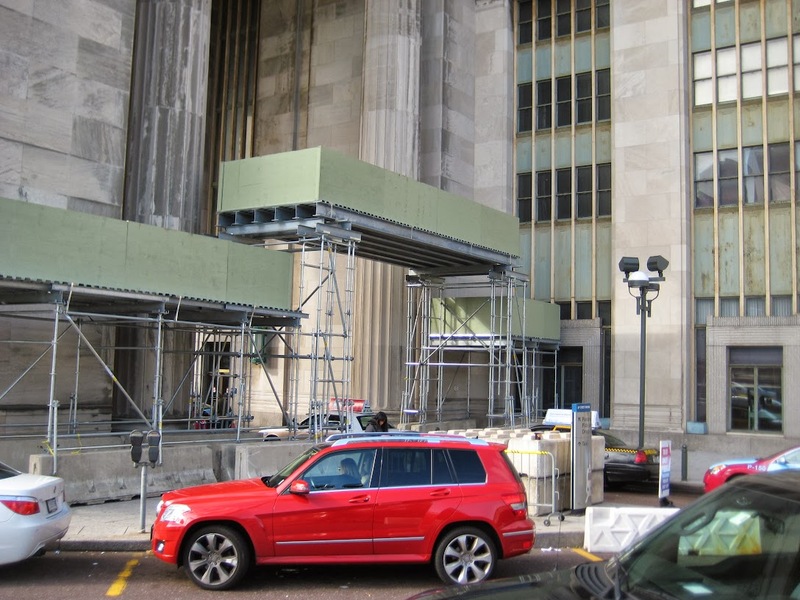 You can see where Superior engineer Bob Robinson called for a thru-bolted channel on the side of the building to carry the giant 40’ steel beams. 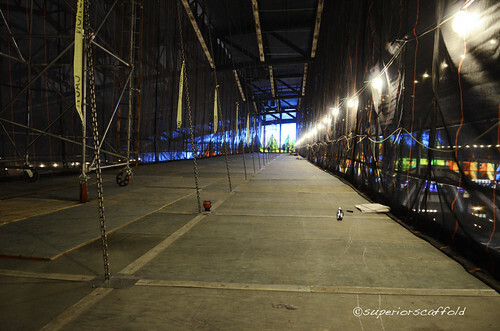 Then on top of those beams they constructed a 5’ wide walkway that takes people out and over the excavation below. So when you look out of the second floor about to exit you will see a walkway that spans the excavation below, completely covered and hand railed. On the other side of the deck are the stairs that take you down. Problem solved. And since it was free standing, the guys put a roof on it, added hand rails and debris netting around the sides to knock down the elements. It’s quite a lovely emergency egress. You see, it’s the simple things in life that make people happy. 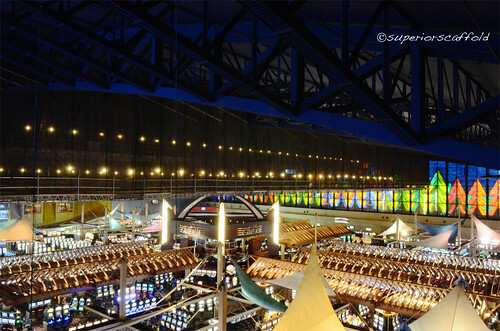 Superior is the best at coming up with functional solutions that make clients happy.